Get the latest news, tutorials, press releases and case studies in all things web. Believe it or not, choosing the right color scheme can grow your ecommerce business. Make the time and effort into choosing the right colors when designing your website and you won’t regret it! Content is key and that also includes colors! Colors evoke emotions and are used wisely by many popular brands to entice people to buy. This goes far beyond just one main color. It’s the contrast of colors on your site and where and how they are used. A critical component of ecommerce websites are product images. Images should be high quality, professional, and speak to your color scheme and brand. Let’s not forget that content is key and consumers are looking for high quality, meaningful content 100% of the time. Colors evoke emotions and actions from consumers so it’s no surprise that using the right colored buttons on your website can lead to even more conversions. Many websites use green buttons as it incites calm and peaceful feelings although if your buttons are not converting your consumers, it’s a good idea to experiment with different colors and track the results so you can choose the color that works best for your website and consumers. Your website’s background color also speaks to your audience. White or light-colored backgrounds are great for ecommerce sites that list variety of products and really allows your audience to focus on the product images. Black backgrounds are also a great option for high-end or bright color products. Your website should have an easily accessible header across the top of every page and making it the secondary color of your brand helps tie your website together. If you are building a new website for your business or redesigning your current website, make sure to dedicate the time to choosing the right color scheme that will ultimately help grow your business. Having a website for your business is key to success however, make these nine mistakes and your users are likely to head for the hills. Poor navigation. Websites should deliver easy navigation on every page. If users can’t easily see where to go and how to get there, they’ll quickly head over to your competitor’s website. Place your navigation bar on the top of the page so it’s always visible and easy to get to. Slow server times. Online users will wait only four seconds before they’re on to the next website! Don’t lose customers because your load time is slow. Work with your website designer to make sure your site and server are conducive to quick loading times. Orphan pages. Every page on your website should have a link that takes your users home. Commonly, many websites link their logo image, usually in the upper left corner of the page, to their home page. This gives easy access to get back home. Disabled back button. Nothing is more frustrating than being on a website that doesn’t allow you to use the back button. This is a sure way to get your users moving to your competitor’s website and they’ll remember not to go back. No easily accessible contact information. Plain and simple, customers want to know they can contact you at any given moment. No contact information or hard to find contact information, sends a message of lack of service. Every page of your website should have your contact information. Broken links. Your website should be regularly maintained for broken links. Every link on your site should be functioning and taking your users where you intend for them to go. Outdated. Content is key, and the importance of content isn’t going anywhere any time soon. Dedicate one person on your team to keeping your site current with fresh, new content. Your business is sure to lose credibility if your content is dated and not updated regularly. Too busy. 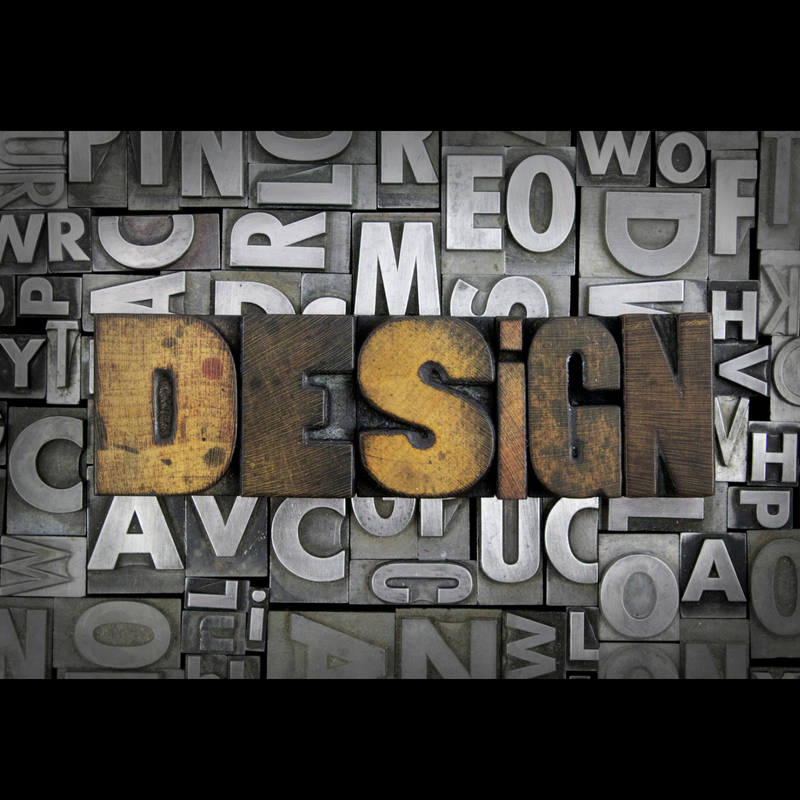 Part of branding includes design, style, and fonts that are concise and cohesive. Sites shouldn’t contain more than three fonts and each piece of content should be in line with your branding. Consistency sends a message to users that your business and brand is stable and strong. No links to social sites. Instagram, Pinterest, Facebook, and Twitter aren’t going anywhere anytime soon and are a great way to advertise your business. Make sure you provide links on your website that directs users right to your social sites. Avoid these nine mistakes and your website will be on the right track to driving your business to success. 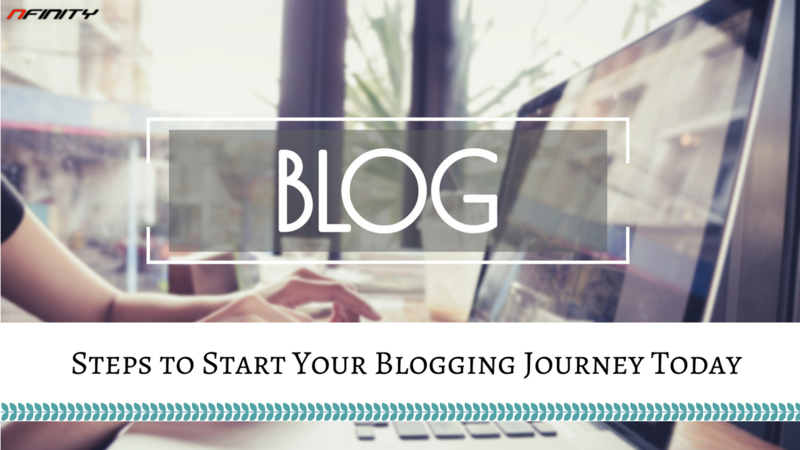 So you’ve finally decided to get on the blogging train, but you’re not exactly sure where to start. Follow these steps to get you on your way to blogging in no time! There is a wide selection of blog platforms to choose from. Tumblr, Weebly, Squarespace, and Wix. But the one that stands out above all the rest is WordPress. WordPress is user friendly, customizable, and FREE. Other good reasons to use WordPress is that there are 5,000+ free and paid themes available to make your design top-notch, they have a helpful forum and over 45,000 plugins to help your blog run more smoothly and efficiently. And the fact that 91% of blogs are running on WordPress is reason alone – that 91% knows there’s something good about WordPress. Choosing the right domain name is important for a few reasons. Your domain will create a first impression among your website visitors, it will affect your search engine ranking, and it will define your brand. You should take careful consideration in selecting the right domain name for your website. When brainstorming and selecting your domain name choose something that will be easy to brand, keep it simple and concise, and make sure it’s easy to type and pronounce. Each of these factors will make a big difference on the long-term impact of the success of your blog. You’ll need a good website host to house all your site’s files, so your blog is accessible to everyone. Without a host, your website will be inaccessible to both you and your readers. When choosing your host, take your time researching various hosts. Some hosts appear to have low monthly fees while secretly, they are charging a myriad of hidden feeds, have poor customer service, and cause your blog site to run slow. After you’ve chosen your host and set it all up, make sure to install your blog platform. If you’ve chosen to use WordPress, WordPress has recommended Bluehost for web hosting for quite some time so the two should work very well together. From this point forward, you can now choose your blog theme in your platform and begin customizing the blog of your dreams! If you’re feeling like it might be time to update and redesign your website, you’re probably right. But here’s 7 questions you can ask yourself to make sure it’s the right time. 1. Is my bounce rate high? A bounce rate is a measurement of how many users landed on your website, but left before ever clicking on another page. So they came, looked quickly, and left. If you’re struggling with conversion rates, this must be resolved! 2. What is my site’s load time? A startling 40% of customers will abandon a website if its load time is longer than 3 seconds. 3 seconds doesn’t seem long, but it is long in the world of consumerism. Consumers want to immediately get to where they’re going and if your site is slow, they’re quick to move on to the next. 3. Is my site mobile friendly? Almost 50% of web traffic comes from mobile phones. Many consumers conduct research and transactions directly from their phones. Within seconds of a consumer going to your site, if it is not mobile friendly, they will leave your site and move on to your competitor. It is not worth risking a great loss of potential consumers. 4. Do my competitors have newer websites? With easy web access in the palm of their hands, many consumers spend time researching companies and picking out what they need before ever making a purchase or stepping foot in a store front. Therefore, if your competitors have better, newer websites than yours, those consumers are likely to give their business to them. Don’t lag your competitors simply because your site isn’t updated! 5. Does my site offer a valuable user experience? Content is key! Consumers want valuable and meaningful content that is applicable to them! Don’t just add fluff to your site to fill space. Consumers will easily see through this and ditch your site for your competitors. Focus on developing content specific for your target audience and it will pay off! 6. Is my web platform easy to manage? If it difficult to make updates, revisions, or other changes to your website, it might be time to get a new web platform with your redesign. Changes, updates, and revisions should be simple and you should be able to make them yourself without having to get a third party involved! 7. Is my site more than 5 years old? Sometimes, it seems the only consistent thing is change. Because technology capability, design, and functions change frequently, chances are, if your site is 5 years old without any updates or refreshing, your site is extremely outdated. 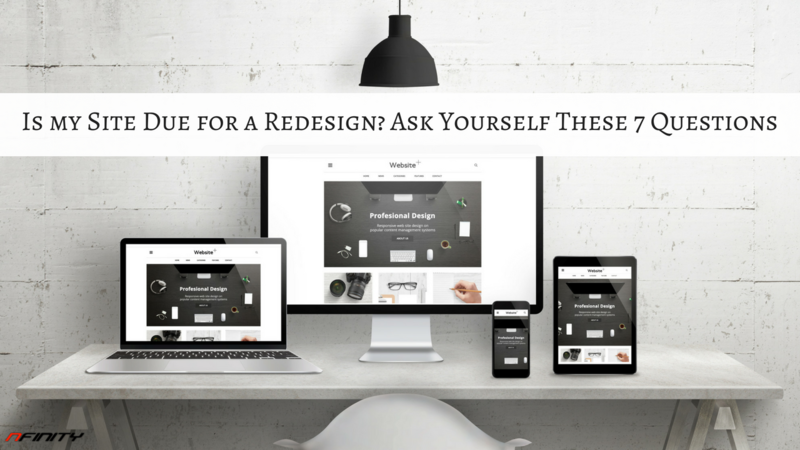 Hopefully answering these questions have helped you identify if your website needs to be redesigned and critical pain points that need to be resolved when developing and designing your new website. As consumers, we know push notifications can be annoying, but as business owners, we love them. 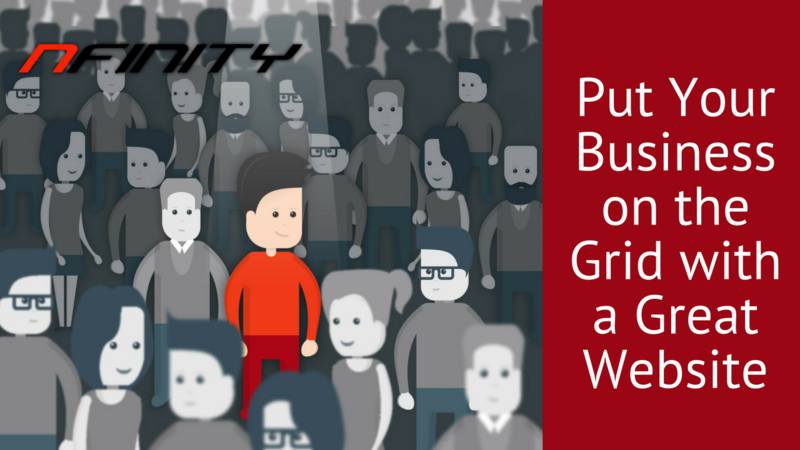 As business owners, how do we make our consumers respond to our push notifications? 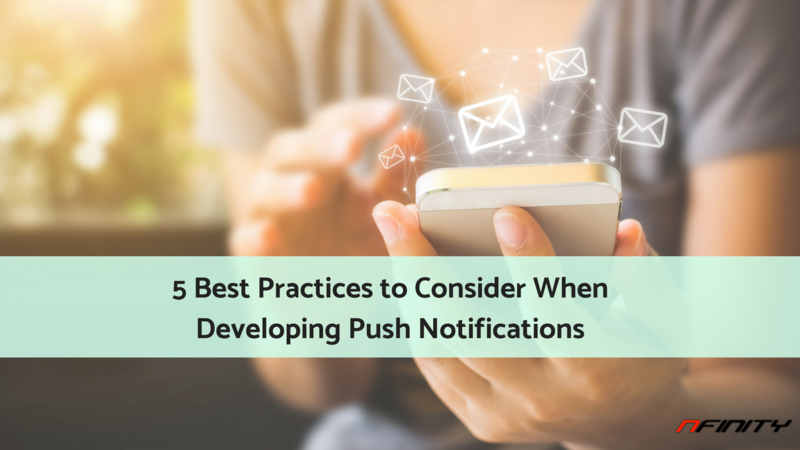 Continue reading for best practices on push notifications. For push notifications to make an influence, they must be relevant and of value to your customers. A large portion of users will delete an app based on poor notifications. When developing your push notifications ask yourself, is this of value to our users? Is this relevant to our users? Will this be seen as spam? Messages that are personalized like using the user’s name, increases your chances of getting them to open the notification. In addition to personalizing, the notification text itself should be short enough that it fits within the notification box. Any longer and you risk losing your users’ interest. Don’t spend your time and energy on developing push notifications only to send them at the wrong time. It seems obvious, but still, some developers and marketers are sending push notifications at times that make it easy for users to ignore and miss altogether. Sending notifications at night could mean waking up a user and irritating them or their phone is on silent and the notification is missed entirely. The best times for notification engagement are mornings from 7-10am and nights from 6-10pm. Use this knowledge to your advantage and schedule your notifications during these times. In determining your best windows for engagement, it’s also a good idea to analyze your users specifically. Push notifications should direct your users to a specific page within your app and not just to the homepage. If users take the time to click on your notification, they want to know that it was worth their while. Notifications should not be created, developed, or deployed without having an actual strategy in place. Don’t just blindly send notifications into the abyss and hope they get seen and opened by your users. Develop goals you want to achieve with your push notifications like getting “x” number of users to sign up for a service or your email list. The strategy shouldn’t end here. Test your notifications and the results you see to fine tune your strategy. You might learn that your messaging isn’t right or the messaging is right, but your process afterward has more steps than your users care to follow. Also, make sure to continually analyze and test your notification strategy to keep up with your users’ preferences. 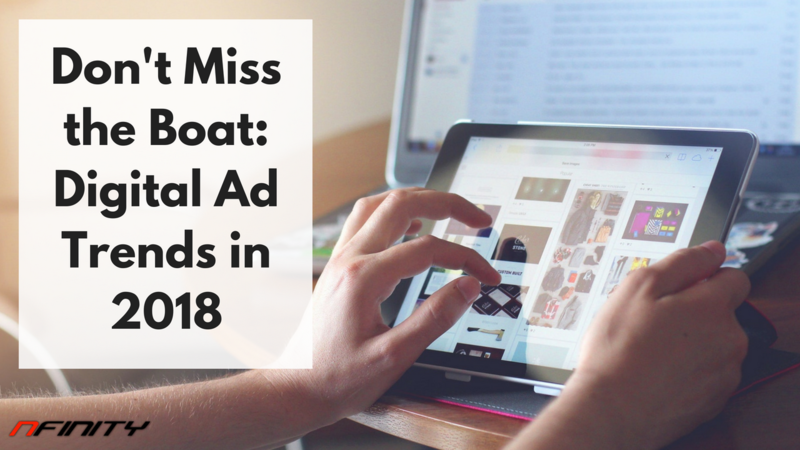 It’s critical to the success of your business to stay ahead of 2018’s best digital advertising trends or you risk falling quickly behind. These trends are sure to carry us into 2019. Digital advertising is the use of technology to market your products to your customers. Specifically, through digital media, mobile phones, and the internet. Not to be confused with advertising via TV commercials or radio ads. What is a digital ad without diversity? In today’s world, diversity is a hot topic and can be used to bring people together and feel connected to your brand. Digital ads connect deeper to customers when they bring diversity to the forefront. Not only diversity in the way we look, but the way we act and think as well. Gone are the days of using old advertising and sales pitches. Consumers are unlikely to fall for them. It’s time to get creative! Create ads that allow customers to learn and know your brand, so they feel connected and feel loyal to it. You might even consider creating an ad that very minimally mentions or shows your product. If you use people in your advertising, use regular every-day people your customers can relate to. Augmented reality allows companies to use something that already exists but use it in a way for customers to see for themselves how certain products will look and fit into their lives and homes. Furniture and design brands are using augmented reality to do just that. Native advertising meets the need of being subtle, yet informative. Native ads are paid for by a company but placed into a digital content stream like websites and social feeds so the content fits in seamlessly and feels natural. 25% more users read native ads than they do traditional ad banners and 97% of mobile media buyers reported that native ads helped them achieve their brand goals. Those two reasons alone are reason enough to use native ads. Based on Cisco studies, it’s anticipated that by 2019, 80% of the world’s internet traffic will be video based. So don’t hesitate to incorporate various forms of videos when advertising your business. You’re better off getting started in the trend now! 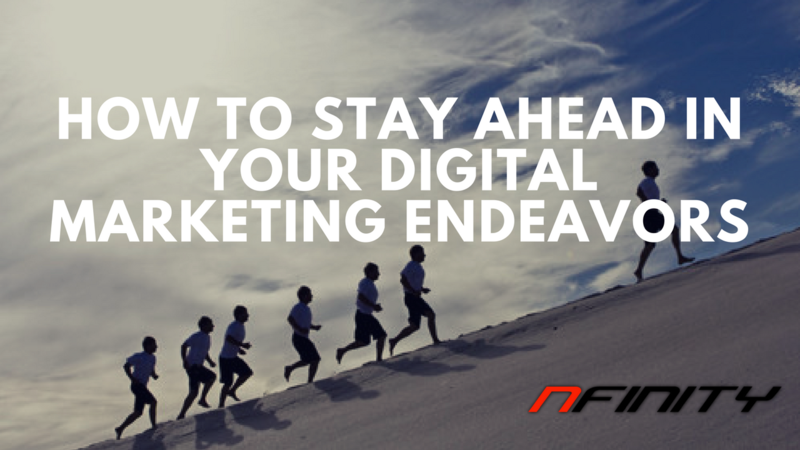 Get ahead of these trends now and perfect them to make the most of your digital advertising. When developing your website, you must consider its compatibility to smart phone users. Otherwise, you risk isolating and losing a sizable portion of your target audience. 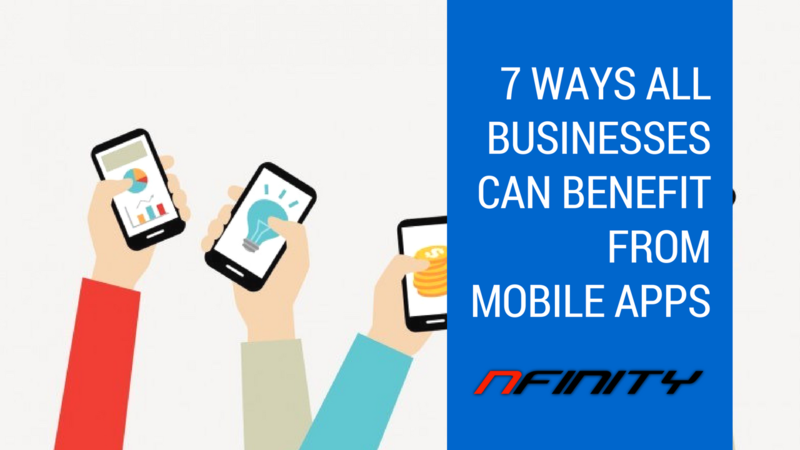 Here are 6 reasons why you should go mobile-friendly or go home! In early 2017, mobile devices accounted for almost 50% of web page views world-wide. While this number is world-wide, the American and European numbers alone are much higher! Many users conduct transactions directly from their phone bypassing a desktop computer altogether. If your website is not mobile-friendly, customers will turn away to your competitors within seconds. The average cell phone users spend over four hours on their phone each day. That’s four hours of time you can put your business in front of every customer, every day. If you place a social media ad that directs customers to your site, but your site isn’t mobile-friendly, you may as well kiss your customers goodbye. Nearly 60% of Google searches are performed on a mobile device and every year, the percentage of mobile users increases while the percentage of desktop users decrease. Customers, within seconds, can find your business on their phone. 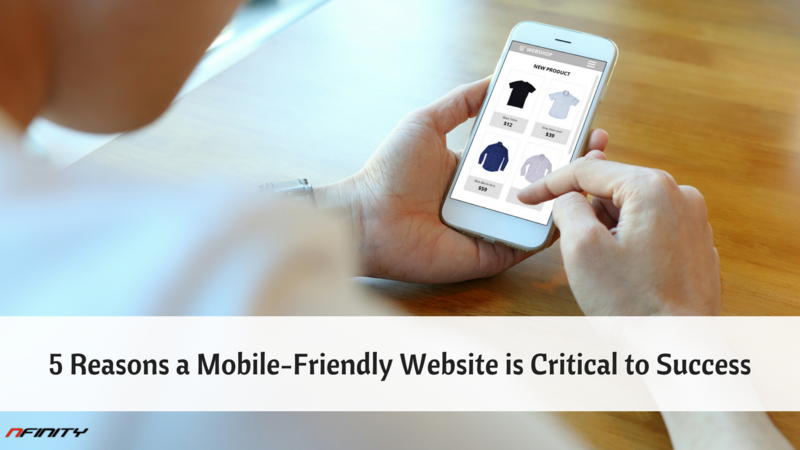 Having a mobile-friendly website will only increase the chances that they’ll choose your business. Millennials are the most technologically advanced generation. That being said, they are the next generation of consumers. Businesses must gear their advertising and websites to the millennial audience or put themselves at risk of failure. In addition, for many people, a mobile phone is their only means of internet access and is also their preferred method for using the internet. A mobile phone can be used on the go, in front of the TV, while you’re cooking in the kitchen, you name it! A mobile user is offered much more flexibility to use their phone. If these reasons haven’t convinced you to have a mobile-friendly website, we don’t know what will! 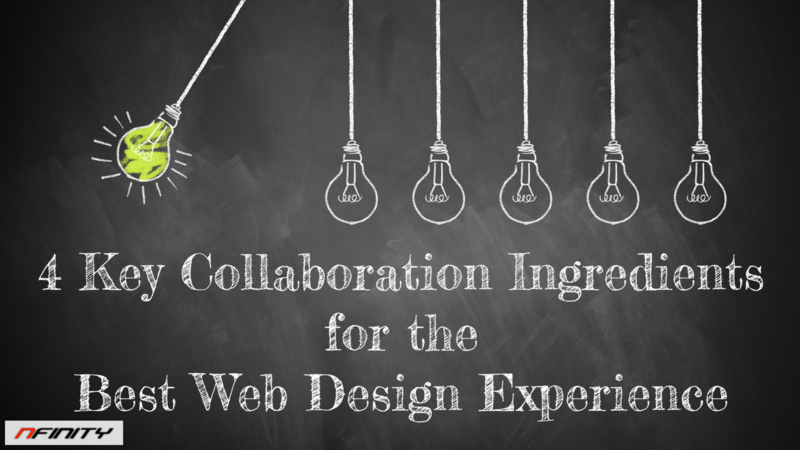 The web designer/client relationship will be most successful if collaboration is at the top of the priority list. Enhance your collaboration efforts using the information below. A recurring theme in the web design arena is audience. Audience, audience, audience! Who is your audience? What are their demographics? What are their needs? Understanding your audience will better help you and your web designer to make decisions about the design, usability, and interface of your website. What is any relationship without trust? Believe it or not, trust between you and your web designer is at the core of a successful relationship and website. Give your web designer the opportunity to learn your business inside and out. This will enable them to make the best decisions for your design and keep consistency throughout. In addition, you, as a client, must be able to feel comfortable in being open and honest with your web designer. And of course, trust doesn’t exist without open communication. Meetings should be held weekly to keep all parties up to date on tasks and deadlines. In addition to those weekly meetings, correspondence between client and web designer should occur between those weekly meetings. Having an open, honest environment will help all parties feel more at ease and comfortable in communicating with each other for the ultimate website design. Goals will be hard to meet if 1, they are not expressed, and 2, they are not agreed upon. Goals should be outlined and discussed in the preliminary design meetings. This will help limit any surprises in the future. Also, keep in mind that over the course of the design creation, conversations will arise and goals will adjust and shift. This will only make your website better. Mapping your initial design and ideas will help foster a collaborative relationship. Giving both parties an opportunity to discuss their vision and any changes they see fit. This gives the perfect opportunity for open dialogue leading you and your designer on the road to a successful outcome and enjoyable experience. As you would expect, the company you hire to develop and design your website can make or break your experience and the quality and functionality of your website. 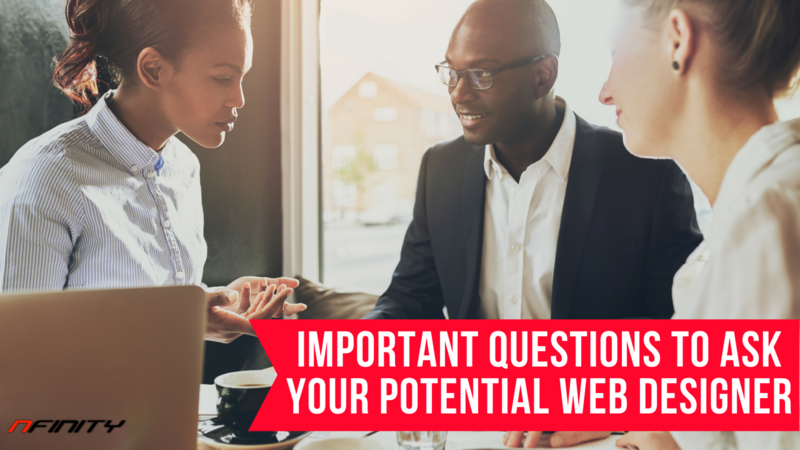 Continue reading for important questions to ask your potential web designer. What is your site build process? Do you want a designer who is brand new to the field? Or a designer that has years of experience? The answer they give you regarding their site build process is sure to let you know what their level of experience is. Experienced web designers know their site build process by heart and with their eyes closed, they will be able to recite their process without referring to any materials. An experienced designer will be able to map out your site’s build process according to your due date and will keep the ball rolling to meet applicable deadlines. Can I contact previous clients for testimonials? An obvious red flag answer to this question is that they don’t have any clients you can contact for testimonials. If this is the case, run! An experienced web designer will happily and proudly provide you with referral contacts so you can obtain the information you need to make your hiring decision. When is your next available design date? Designers typically shouldn’t be immediately available to start your project today or even tomorrow! A good, experienced, reliable designer is already working on a client’s design and will be able to schedule you out in 1-3 weeks. On the same note, if you have a deadline of when you need to begin your website design, start looking a month in advance! It is uncommon to find a single designer that can do everything asked of them like custom fonts, illustrations, logo design, and copywriting. A good designer will know their areas of expertise and know what needs to be outsourced and to who. Find out what they will outsource and where the work goes. If they outsource out of the country, you may want to do more homework before you make your final hiring decision. How do I complete continued site maintenance? While some designers will complete maintenance on your behalf for a fee, others will turn the reigns over to you so you can continue your own site maintenance. Whatever the case, just make sure the completion of future maintenance is something you’re comfortable with. One of the best ROIs for your business is investing time and money into logo design. Here are 6 reasons why you should invest in hiring a professional to design your logo. 1. As much as you might not want to believe it, when businesses fail, a part of that failure comes from poor branding and logo design. Knowing this, why take any chances? Your logo is the one graphic that draws customers in or scares them away and genuinely reflects the style and importance of your brand. If you aren’t loving your logo, it’s a good idea to hire a professional to redesign your logo. 2. A strong, thoughtfully designed logo instantly creates trust with your customers. Think of the most popular brands you love, we’re sure their logo has something to do with the relationship you’ve established with them! 3. Your logo will be seen everywhere! And by everywhere, we mean on your website, business cards, letterhead, brochures, buildings, and apparel. Your logo should accurately represent your business and attract customers interest. 4. Having a clean, simple, consistent logo establishes you as a leader in your field. These types of designs are recognizable and easy to remember. Your logo should be recognizable so customers know it’s your company if they saw the logo alone! 5. Logos created in a pinch are sure to be revisited time and time again. Professionally designed logos last nearly a lifetime. Take the time to work with a professional designer so your logo lasts the entire lifetime of your business if not longer. 6. Professional designers know what works and what doesn’t. They know what is instantly appealing to customers and what will turn them away. By collaborating with a designer, you get their expertise and you bring your passion for the brand of your business. This combination is sure to lead to a successfully designed logo. 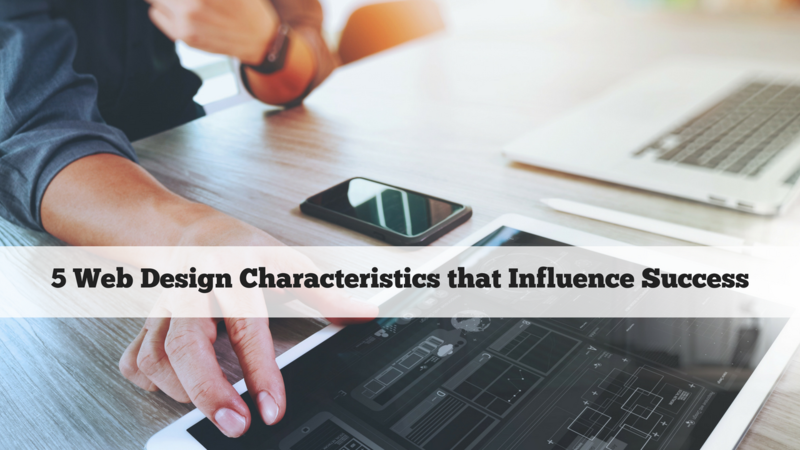 Believe it or not, there are characteristics of your website’s design that are influencing its success this very moment. Continue reading to make sure you are exceeding expectations in these areas. Good web design without high-quality content is just that, the bones of a website without anything to hold it together. Content should be creative, substantial, and build trust among your viewers. Creating that sense of trust and confidence in your viewers will aid in converting them into customers. Providing reviews on your website is a great way to build trust and confidence in your viewers. Cluttered, distracting websites are sure to lead your viewers elsewhere. Your website should be simple and easy to use. Include your most important and valued elements to your viewers like products, services, reviews, and contact information. In the simplicity of your design, make any contact information or call-to-action buttons stand out making it easy for viewers to find them. There’s no doubt we’ve all been spoiled with fast websites that when we reach a website that takes only a few seconds too long, we’re already closing that page and looking for the next. Don’t fall victim to slow loading times as this is sure to drive away your viewers and lower your Google ranking. While there’s no proven connection between an attractive design and converting viewers into customers, it is likely that a good design will build a viewer’s sense of trust in your business. In maintaining your attractive design, make sure it keeps up with the trends of design. In other words, make sure your website design doesn’t look dated. Chances are there are more than a handful of other companies that are offering the same products and services as you. In the realm of determining what makes you stand out from your competitors, don’t forget to include your website design. If your website isn’t made to be unique and memorable by using color, illustrations, and consistency, you’re highly likely to blend right in with the rest making it difficult for viewers to remember who you are. Typography in web design is a trend that won’t be dying any time soon. Getting creative with your typography is sure to attract customers! For years, Sans Serif has been the way to go in terms of typography, but the truth is the possibilities are ENDLESS! Serif fonts will be making a huge come back this year so make sure you don’t fall off the wagon! There has never been a better time to get creative with your typography on your website! 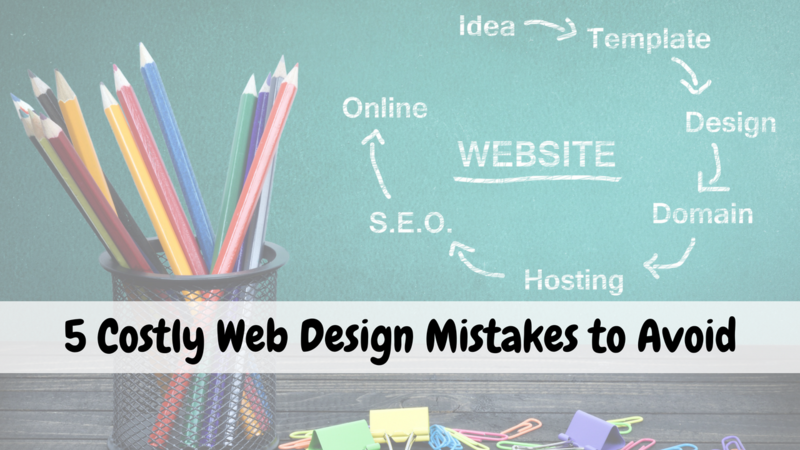 Web design mistakes are easy to make yet costly to your business. Avoid these five common web design mistakes and you’ll be well on your way to designing a successful website! It’s a common mistake that can leave you with a huge bill to foot. We recommend you invest in a high-quality plan before taking the first step to designing your website. Do your research about key factors like your target audience and what type of content will interest them. In addition, it’s critical to analyze your top competitors and determine what works for them and what their audience loves about them. Make sure you have sufficient channels for your customers to contact you! This is a common problem and often makes it hard for you to convert leads into customers. Leave a clear Contact Us page that details all the information needed to contact you. The ability to contact you should be effortless in the eyes of your potential customers; this will help you turn leads into paying, returning customers. One of the big kickers these days that absolutely cannot be missed is CONTENT! Content is key! You hear it over and over because it’s true! Content must be relevant, applicable, and interesting to your target audience. Eye-catching content means the difference of attracting and maintaining customers versus losing them to your competitors. A critical mistake is failure to vet and manage links. Links should be managed on a weekly basis to ensure none of them are broken. Broken links are extremely frustrating to site visitors and may lead them elsewhere. The simplicity of your web design goes a long way to attracting and keeping your customers. Cluttered designs with multiple fonts and colors can be off-putting, overwhelming, and distracting. 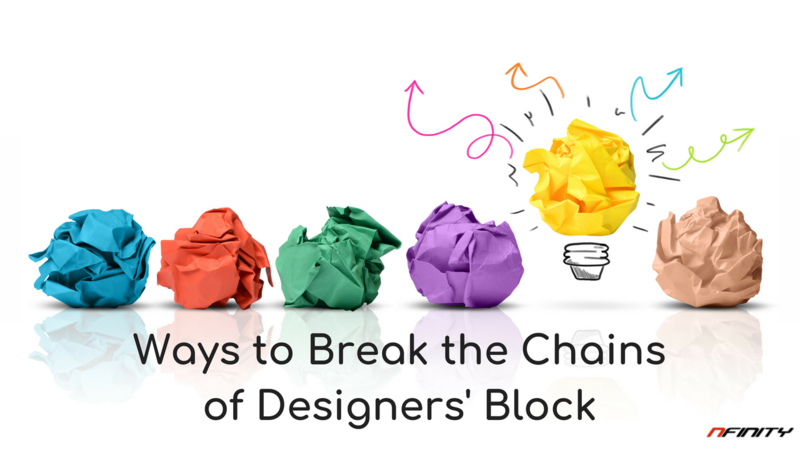 Your design should be attractive and easy to read and make your viewers come back for more. Trends come and go and we are always on the never-ending quest for the coming year’s web design trends. Continue reading to see some of this year’s hottest web design trends. 1. While grids were once a way to keep harmony and logic to our web layouts, broken grid layouts have now become a way to design more engaging layouts and they also offer more creativity. This isn’t to say we should bag grid layouts entirely, but broken grids allow images and text to drift into and across the page. Text and images don’t align perfectly, but this offers a beautiful page that is eye-catching. 2. Rather than letting text on the page do all the talking, bright and meaningful illustrations can be very powerful in bringing abstract concepts to life. Illustrations, if done right, is the initial hook to the customer, bringing them in to see more and learn more about your company. In addition, using an illustration can release the constraints and perception of who your customer might be. A photo of an actual person represents that one person as a user to your company and leaves all other customers unrepresented and possibly feeling unconnected to your brand. 3. Another trend rising to the surface of 2018 is a floating navigation. For years, navigation has remained fixed at the top of websites causing the user to need to scroll back to the top if they need to access the main site navigation. Now, websites are being designed with the navigation always at your fingertips creating a feeling of security and support to users. 4. Sometimes text just won’t do. It is simply not enough to convey a message or drive a point home. This is where video element is the perfect element for web design. Video remains high quality while other graphics cannot. 5. Variable font comes in as a big game player in the 2018 web design arena. There are hundreds of font options to choose from allowing anyone to use font as a creative and expressive element in designing their website. So what’s the big kicker with variable font you ask? Variable font is one single font file, but allows you to have tens of thousands of variations in that one single font. This is undoubtedly incredible! 6. Another design trend that is making waves in 2018 is gradients. Flat design has typically been a preferred design, but gradients are becoming more and more popular. Gradients add an element to design and images that cannot be found in flat design. It adds an intriguing element that catches viewers’ attention. 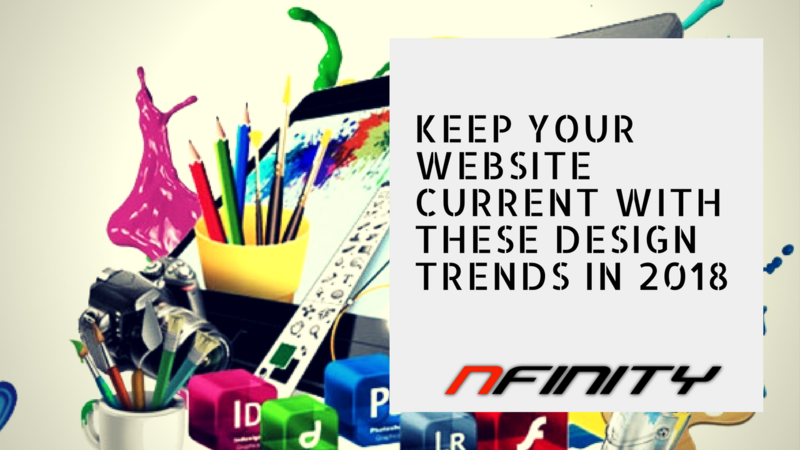 When designing your new website or renovating your existing website, make sure to include some of these hot trends which are sure to get customers looking your way! As you will have no doubt discovered, social media plays a major role in how we work today. Through the likes of Nfinity Web Solutions, you can help to make your business more powerful than ever using social media use. It’s for more than just creating an organic reaction to your customers: it’s about improving your chances of positive search engine optimization. If you use social media regularly, you can help to improve both your business performance and your natural SEO ranking. 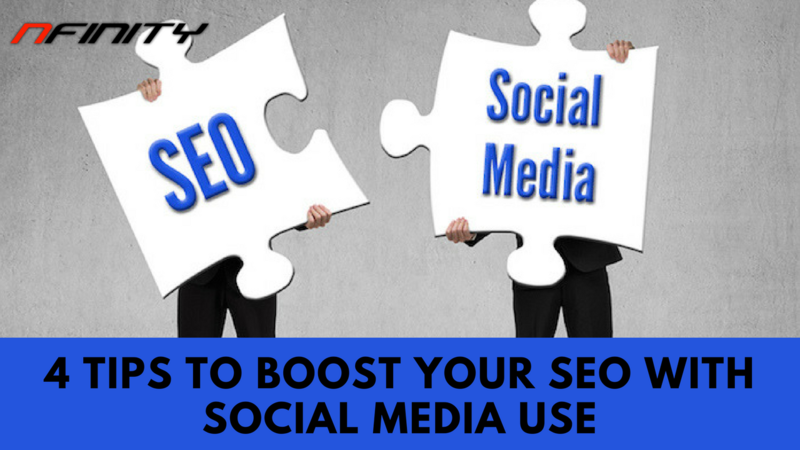 If you want to learn the best way to do that, you can take a look at these four tips to help boost SEO with social media usage. One of the best things that you can do is get what we will call meaningful followers. The right followers are the ones with a genuine interest in what you have to say. Your business needs more followers who are interested, and less who follow because they were paid to or simply because you offered them a good time. A high-quality social media following that all interact and engage are much more likely to get you higher ROI than a large five-figure follower count that barely even notice your posts. Another powerful part of the social media SEO strategy we want to showcase is using social media for link building. With a good following that cares about what you post, you can have your link(s) to website/blog pages posted all across the web for you. The more times people link to it, the better the ranking becomes and the more likely it is that people will see the link as they look around social media. This not only helps to boost SEO rankings normally, but it helps to make sure that you can attract people with more value. Brand building is very important, and this means using social media to build interest in non-promotional posts. From helping to boost rankings for advice pieces to making it easier for you to make the right kind of impression, brand building is much easier when you use social media. Veer away from the promotional side of things, and you are much more likely to get the many benefits of using social media as a marketing tool. The more discussions you have with locals on social media, the more likely you are to find yourself soaring for local search terms and the like. 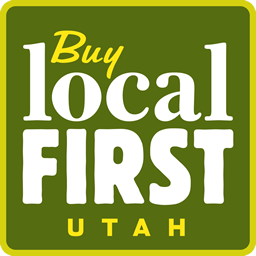 This is very important – it can help you to reach out to locals and to help get involved with local causes and community projects. From sharing missing posts for locals to help raise awareness to retweeting a local charity page, you can use social media to engage with your local community, boost SEO and do a good deed all at once. With the above, then, you should be able to see just why using social media for SEO makes perfect sense. Done right, this can absolutely transform the way your business works. When it comes to running a business today, you need to look at a website. Many people who don’t use the internet much personally tend to make that a worldwide point of view. They think that since they don’t use it all the time, that others are the same. Besides, building a website is complicated, right? And it costs so much money, correct? With Nfinity Web Solutions, that’s rarely – if ever – the case. We can help to get you on the map ad spotted by customers locally, nationally and globally. To do that though, there has to be an appreciation and an understanding of the unique challenges involved with running a business. So, how can go a business website be a catalyst to improving the way in which your business is received and looked at? How can you make sure that people enjoy their user experience instead of fear it and/or be put off by it? The first ‘must’ for your new website is to make it customer-friendly. The more customer support solutions that you can bring up, the more likely that you are to see a proper change in circumstance. If you want to provide proper online support, then you need to make it easy for you them. Contact answers, live chat support and messaging services are all a must in the modern business website. It might seem small, but the impact that it can have on your business is seismic! One of the best ways to help your business get spotted and become more generally visible is to turn to Google searches. Getting yourself on the map is tough work, but with the likes of Google My Business, we can make sure that you are instantly more visible than beforehand. If you want to get spotted. If you want to help become a greater presence in your local area, this can be vital to making that achievable and possible. Another great reason for having a website is that it can put you on the map better than ever with greater media control. Show people what your products do, or the end result in using your services will provide. One of the best ways to show people the benefits of using your business is to do so by example – use photos, as they can paint the image a thousand words simply cannot. Another powerful tool that you could use to help make your business thrive online and offline is a good blog. Blog pages will allow you to get the help that you need to start making the most of your businesses message, and ensure that you can pass the right message on at the right time. If you are serious about making your business a success, then you should look into using all four of the above services. Each one can go a long way to making your business more likely to be a success, so give it a try! For any business owner, one of the single most important features that you can have is a powerful, active and engaging website user experience. A good website user experience is hard to find most of the time, and that’s because most sites repeat the same mistakes. While being inspired by a major competitor isn’t a bad thing, you might find that being too similar to them means taking on the same user experience problems that they suffer from. 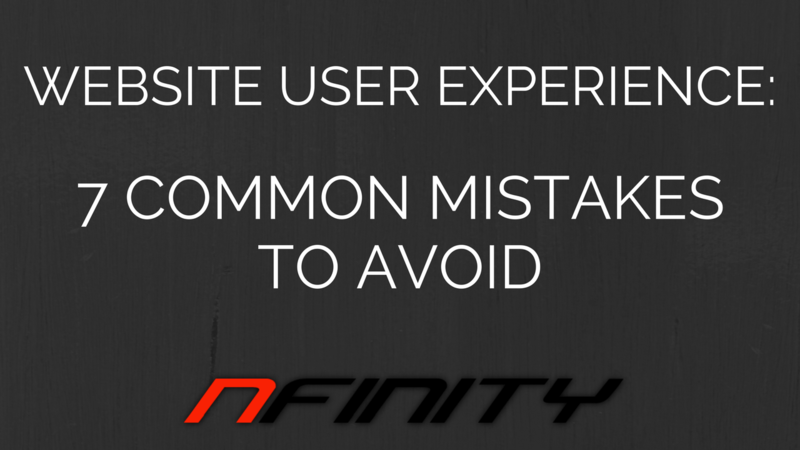 So, what are some of the most common mistakes to avoid when developing your new and improved website user experience? What matters? Going down the desktop route. While it would be insulting to just ignore the power of desktop computing, the age of mobile is upon us. 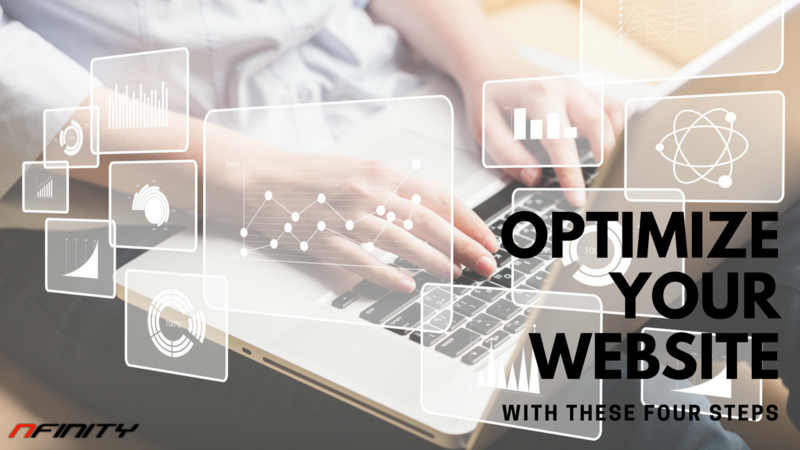 If you keep building your website based on a primarily desktop experience, then you can soon find that numbers dwindle and opportunities become more fallow. Poor customer service. While you personally might hate those 24/7 live chat modules on most sites, they are a massive win with the customer. Sure, it might be annoying just now, but it’s not something you need to necessarily put up with. Improve customer service, and boost your customer retention. Excessive content. Content is the King and likely always will be, as the likelihood of making reading extinct is a very distant possibility (thankfully). Still, you should look to use a fine blend of images, videos and text to help make sure that your site is as diverse as possible. Poorly worded content. Another mistake is trying to mask your main aim as a business in flash wording and nonsense. Try and be bold – it’s actually more likely to help you stand out and be seen as a more active, refreshing choice of business to work with. Clarity is better than vague terms over your ‘vision’ and the like. Poor opt-in. A massive mistake is not getting the customer involved; not showing them that the true art of success lies within your content. Make them want to get involved is very important. Avoid bombarding them with sign-up requests, but don’t be shy to ask, either. Long-term errors. Now, you might not be a coding whizz. That means that you might leave that user experience problem that customers are all complaining about due to a lack of knowledge. While you shouldn’t try to fix what you don’t understand, you should hire someone who can fix it. Constant change. One of the worst mistakes that you can make as a business is change for changes sake. Only change something when the analysis and the figures states that it should be changed; don’t change something for the sake of it or to experiment: work with what works change what is broken. Using the above ideas, you should soon find it much easier to start making legitimate, lasting progress as a business. While it might prove to a massive challenge, it’s by far and away a challenge that your business can rise to meet! Mobile apps in the business world are no longer a novelty given the sheer number of enterprises with their own. From big name brands in commercial, financial and service sectors to startups, the craze is spreading like bushfire. It’s awesome to see the small and midsize businesses accepting this trend and developing dedicated mobile apps with all the features of a great app. If you’re thinking about designing a mobile app for your budding business as well, you should feel motivated even more given the following benefits your business will undoubtedly enjoy. More importantly, you can give Nfinity Web Solutions a shot – they certainly don’t disappoint. Statistically, an average American spends over two hours a day browsing over a mobile device. During the two hours, the user will probably use a few apps. However, that doesn’t mean yours will only be there with no importance. By the customer having your app on their device, you will be visible in their eyes throughout. As well as containing general info, prices, product features, user accounts, massagers, news feed and more, the app provides regular information on special offers, sale promos, etc. With push notifications, you will be smoothly reaching out to them. Instead of investing in an expensive marketing campaign, you can channel those funds into a loyalty program and use the app to market it. Customers will download your app and use it so that they get as many reward points as possible. And this will mean more return customers! It’s natural for your brand and attention to increase after you release a mobile app. As an excellent brand marketer, your app acts as a billboard sign, albeit in each user’s mobile device. But the best thing about this “portable” billboard is how you are free to make it stylish, functional and informative – well branded, but incredibly designed. Also, as your app gets more reviews and downloads, the larger the recognition it amasses. And this ends up supercharging your turnovers. Regardless of the nature of your business, having a mobile app will mean your customers get to reach you in a secure, seamless way. If it has a messaging or helps desk feature, customers will prefer to reach you via the app rather than calling, and this will have increased the use of your app. Many businesses are yet to accept mobile apps as a core facet of their businesses. Having one, therefore, will mean you will be head and shoulders ahead of them and even their customers will get to download your app and be yours too. If you don’t think it isn’t worth a mobile app and all the aforementioned benefits are just a ploy, rest assured this last one is automatic. An app is the simplest way of earning their trust amongst your current as well as your potential customers. It creates a genuine and sincere connection, making them stick to your brand since you’ll always be a “fingertip” away. Mobile apps seem to be the way to go in the future, no doubt. Before it becomes a standard of any business, you can be the proverbial “early bird” and set the right foundation before anyone else does. Whenever a company delights its buyers with quality products, praiseworthy services or surprise discounts, it receives free word-of-mouth publicizing which later earns more customers. 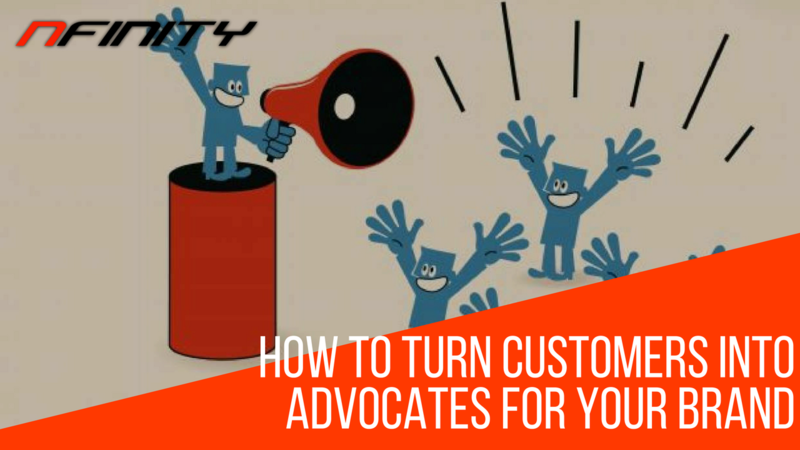 Would you like to convert your customers into your greatest advocates? Turns out, the simplest way of promoting one’s brand is by inspiring one’s clients to be advocates of goodwill. By willingly vouching for the business, both formally and informally, the amount of publicity generated will be enough to usurp the number of impact competitors may have left. As per a report presented by IDC research on the same in 2016, a modest 10% of all B2B companies captured in the survey had customer advocacy initiative. In 2017, however, the figures had shot to 67%, which simply speaks a lot about the present day access to information and unprecedented transparency. Naturally, unhappy customers tend to air their frustrations about a past unpleasant experience. However, as the numbers above report, it seems the trend could be changing. And much as the clients appear as the winners, businesses that offer better customer experience rapid revenue growth. If the enjoyable treatment continues, the amount of advocacy invariably multiplies, thus getting the seller more revenue. Buyers tend to trust the opinion of their peers and junior employees with nobody seemingly buying the voice of the CEOs. As many as 62% of customers would love to know how real people, including those who belong to their level say. And if a brand harnesses the voice of the customer, it can market itself without necessarily spending a dime! If you’re an entrepreneur of a B2B or B2C startup, gaining an advocate might not be easy. Sure, you could be boasting satisfaction stats, great customer engagement and growing base of ardent customers. Find and publicize useful data: when a customer understands the full benefit of a product or service rendered by you, the person will be more inclined to appreciate it and later recommending others. Naturally, it can take over 18 months for someone to be confident enough to recommend you. However, by publicizing the useful aspects of your product or service, a client can begin advocating sooner. Empower employees to deliver warm customer experience consistently: this isn’t trivial because – more they provide on their word, the more powerful the advocacy becomes. Empowering them would mean starting from revolutionizing their look, tone, and mood of their interactions and everything that can change their attitude about the business into a pleasant one. Leverage technology to scale advocacy: references and referrals given online matter a lot, mainly because they’re offered by those who you’ve never met. Finally, stick to your real identity – don’t fake your reviews: buyers tend to accept a referral offered by someone they know rather than a paid marketer. Since customers can advocate for a company they’ve interacted with, don’t try to buy the review. By delivering according to your promise, valuable experiences will give customers a reason to suggest you to somebody else. 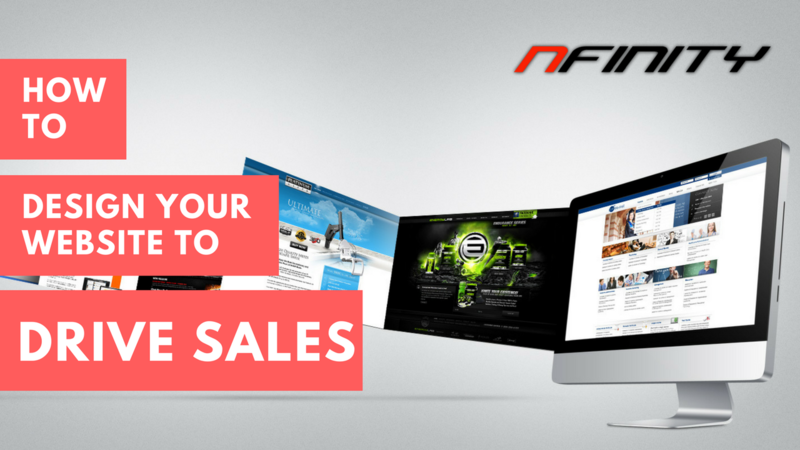 Extra Tip: Nfinity Web Solutions has irresistible offers worth checking out! In the end, customers are more inclined to advocate for a company that valued them to a friend. So, as you engage in other forms of marketing, don’t forget to tap into word-of-mouth marketing too, after all, it’s cheaper, faster and even more effective! Much as having a million dollar business idea is awesome, executing it with the aid of a robust marketing plan can boost its publicity and turnovers. Marketing, the art vehemently promoting a product or service has been evolving and the latest hit is Facebook marketing. And the sheer amount of money often bestowed to digital marketing nowadays by blue-chip corporations say it all. If you’re planning to kick-start the digital marketing campaign for your startup in 2018, just spend some time and come up with a realistic marketing strategy. 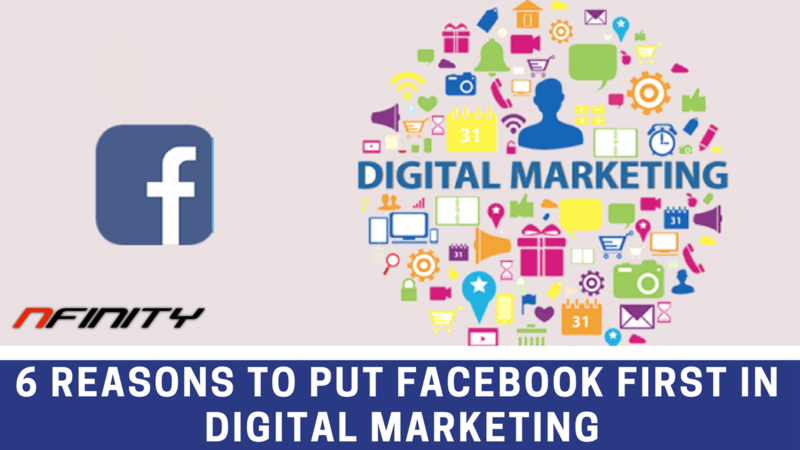 More specifically, your focus should be on Facebook marketing given that it’s the most vouched for amongst all the many digital marketing channels. Given that successful digital marketing campaigns nowadays are built around a particular audience, Facebook is just the right one for your kind of audience. The Facebook Custom Audience Tool works like a charm, enabling marketers to upload contact details of their preferred targets for a near-perfect delivery of ads. At the moment, there’s no other online marketing channel with the precision of Facebook and the main difference is this factor. To better understand this, let’s take the case of Donald Trump and the much-hyped election which he won. After spending $150 million on Facebook and Instagram advertisements discouraging voters from backing his nemesis, the team delivered the victory. However, the team only managed to ensure the success of this method using Project Alamo, a database that had identity profiles of 220 million people. Even when Facebook currently boasts a whopping 1.79 billion active users every month, it’s incredible that prices on ads are lower than on Google. Facebook is the single largest social website, and if numbers mean a lot to you, then it is the right place to advertise at. Facebook can primarily serve as great Public Relations managing site. Through the Brand Awareness ads that use a blend of real-time proxy metrics with attention and reach, business benefits in huge facets. However, it’s crucial to start the campaign early enough so that you build the base soon enough. Give your business’ followers a behind-the-curtains look of the market. Offer sneak previews and teasers for upcoming products or services. Hold a quick Q&A session in real-time. When Zuckerberg unleashed the 10-year roadmap, many businesses chose Facebook Messenger as a convenient tool for engagement with customers. Shopify is one of them, and as the list keeps growing, you also need to. Chatbots are slowly becoming a necessity as they create structured messages, images, links and CTA buttons intuitively. Your clients will prefer to DM your company’s Facebook page when they have a burning issue, rather than calling or sending emails. Replying to Comments also helps draw more customers to your business. The bottom-line is, while Facebook is growing every day, you’ve got no reason to be part of this revolution. If you’d like to give it a go, just check out what Nfinity Web Solutions has in store! Marketing has never stopped moving, both in how it is done and executed and the mode in which marketers employ. Days of TVs, radio and billboard commercials dominating the scene are long gone, replaced with the internet and social media platforms. Today, digital advertising is the in-thing with digital marketers jostling to have a share of the revolution and the perks that come with it. Digital marketers aren’t unique and special types of people. You are also a digital marketer if you often post photos and adverts of your wares via social media. The scope of it is so enormous that it can accommodate all of us! But in the midst of the vast space that is digital marketing, losers and winners will always be there. Individuals and businesses whose understanding of the swiftness of the marketing trends is above par typically work on their marketing tactics ahead of time. They go against the tide and away from the conventional, going to as far as following Asif Razzaq’s suggestions that email marketing is better than social media. It is an open secret that desktop’s relevance will soon be a thing of the past. Their dominance will continue going down as that of mobile devices keep scaling up the market share, particularly in advert reachability, customer engagement and conversion rates. Research by Statcounter states that smartphone usage currently is at 50.87%, up from 2012’s 8.49%, which merely supports the idea of mobile dominating the scene. On the contrary, the slump in the use of desktops will keep on. Away from this statistics, mobile phones are expected to be every marketer’s arsenal, irrespective of the industry, business or product and mobile advertising will be worth $107 billion soon, according to Zenith. Google seemingly supports the resurgence of mobile too, especially if you consider the impact of a mobile-first algorithm and mobile content-indexing. Another step away from the conventional styles of marketing is geo-targeting marketing, and it will be quite commonplace in the future. Location-based advertising isn’t just effective in generating leads; it costs less to start and run since the target area is small. By 2021, location-based adverts will amount to over $32.4 billion. They say a single picture is worth a thousand words, but as it turns out, Forrester research expects a minute-long video to be worth about 1.8 million words. Video marketing is expected to take over digital advertising in the future. Currently, video content is the most preferred way of earning traffic and engagements, getting leads and boosting conversions. Videos are easy to share and can go viral pretty quickly. That translates to more engagement since video actually demands participation. In this year, therefore, let your business concentrate on creating memorable video content for its website, landing pages, ads, etc. Remember, video is the best marketing tool today, and it’s used by 63% of businesses, according to Wyzowl report. Segregate your audience according to their respective demographics when rolling out a marketing campaign and you will not go wrong. As much as 78% of consumers prefer to respond to a brand whose content is personalized to suit their needs. The world is gradually becoming digital with everything sourced straight from the web, and many businesses will understandably need someone who knows SEO. But that means more people will be trying to make a career out of SEO, thereby becoming a competition for established professionals. If you would like to advance your expertise in SEO, it would be smart also to consider polishing your skills as a way of making yourself an all-rounder. Having a firm grasp of some skills will make you the team leader whose word is final. Here are the best skills you most probably need right now to improve your SEO. As the first and most critical skill, analysis is a vague concept you will need in multiple areas of SEO. Being analytical would mean you can accept data on “who, what, where and when” and discern the “how” and “why” of every project. Looking at a report on organic traffic, for example, you will need to analyze what caused the ranking drops, track down the causes and crunch data on which keywords are the best. It is the second most important skill for a reason. As an SEO expert, most of your work will involve research on keywords, competitor analysis, insights, and analytics. You will need to create a campaign that’s sure to succeed, not a gamble. Also, being excellent in research would mean you are abreast with what’s happening in the technology world so that you apply the latest tactics. It isn’t necessarily true that all award-winning SEO specialists are proficient in programming. Most of the CMS systems today have a simple, built-in SEO functionality that needs no form of coding. But when push comes to shove, you may need to apply some coding basics, maybe using the source code of a given website to determine the campaign features from the competitor’s site. After a few years as a professional SEO expert, you might think that you’ve mastered everything about this field. However, this niche is filled with surprises, and you might find today’s best tactic becoming useless next year. So, be humble and willing to learn, keep your eyes and ears open and never stop learning. Communication is as important in an SEO environment as the beauty of creating and executing a successful campaign. The team must be updated about what needs to be done, when and where. They will also need explanations and answers to questions they could be having. All these, without a doubt, can’t be possible if your communication skills are below par. How fast you can understand new strategies and tactics can have a huge impact on how soon you will be a pro. That’s why it is practically essential to be a fast-learner and be able to grasp different skills needed in the industry. It is a mannerism that will place you at the focal point in SEO. When your tactics go wrong and bear no fruits, criticism, and misunderstandings automatically follow. However, tenancy is a trait that will ensure you don’t succumb to the pressure and low moments, but instead thrive on them. It is not late to start working on yourself, and these foundational skills will act as a roadmap to a better future. You can start by improving one after another until you are adequately suited for the job. But remember, there’s no end to be being a student – don’t quit, don’t settle! When a creator sits down to design a website, such a person is expected to tilt the scale to either focus on what Google advocates for – user experience, or just SEO. Designers of the past decade knew nothing about user experience and would maximize SEO, a strategy that worked back then. Today, the narrative is different, and user experience reigns supreme. SEO optimization is still vital, but comes second. But search Engine Optimization is still a novelty to many. You can find a page that is a bit too optimized – filled with too many keywords, hyperlinks and vast amounts of texts that don’t make sense. Even if they may not be necessarily spammy, the site could be pathetic! 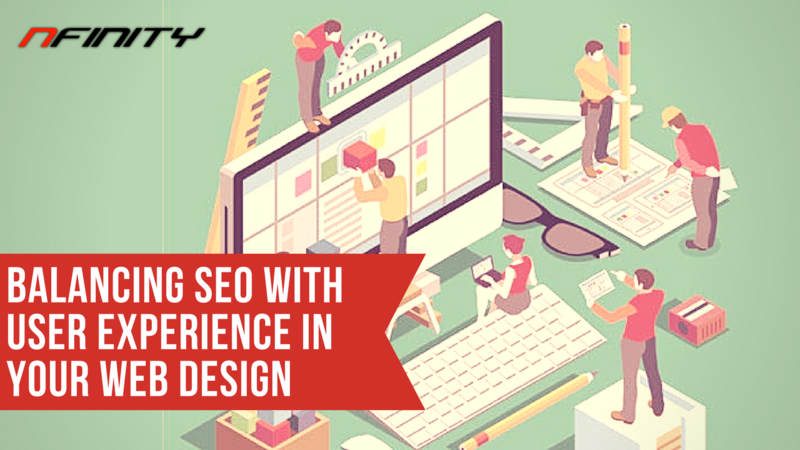 This leads us to what many savvy designers and SEO gurus are trying to understand – balancing SEO with the user experience. Nowadays, the design is drifting towards minimalism in each sense of it. Few words, few images and videos, few keywords and few everything, is the norm, a little like how Nfinity Web Solutions website appears. If you are creating a website, and you need to draw the line between UX and SEO, consider the following. SEO is excelling because it is flexible. Each page ranks for its factor, and some pages will not rank for anything, which is perfectly acceptable. However, while designing each of these pages, spend a moment to weigh its utility before you hit the “Publish” tab. Just ask yourself the essence of the page and if it genuinely needs to be there. A landing page, can be excellent if incorporated into a paid advertising campaign and thus when designing it, consider user experience (UX) a lot more than the keywords. That way, the page will serve its purpose of appealing to users and directing them to a valuable space. Consequently, when the page’s purpose is to rank organically on SERPs, of course, it would be reasonable to think about all-things SEO, including keyword usage. While doing it, however, try to maintain awesome user experience like that of Nfinity Web Solutions. A sleek and beautiful page with no substantial information belongs to a trash bin. Usually, SEO oriented pages aren’t overwhelmed with too much information. Therefore, to set the point clear, know when i is “too much” by testing different page designs. The real answer to everything including bounce-rate, click-through and how relevant users will find your site is by experimentation. It is incredibly hard to discover the right balance between user experience and SEO, but it is possible. First, let the user experience come first by asking yourself what the user could be looking for when landing on the page. It could be to find an answer to an issue, buy from you, be inspired, get your contacts, etc. 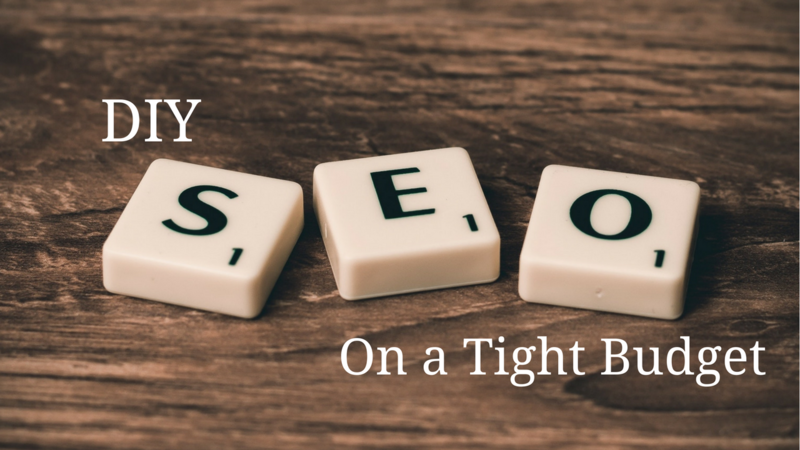 Once you have the right intentions in mind, incorporating SEO will be very easy. 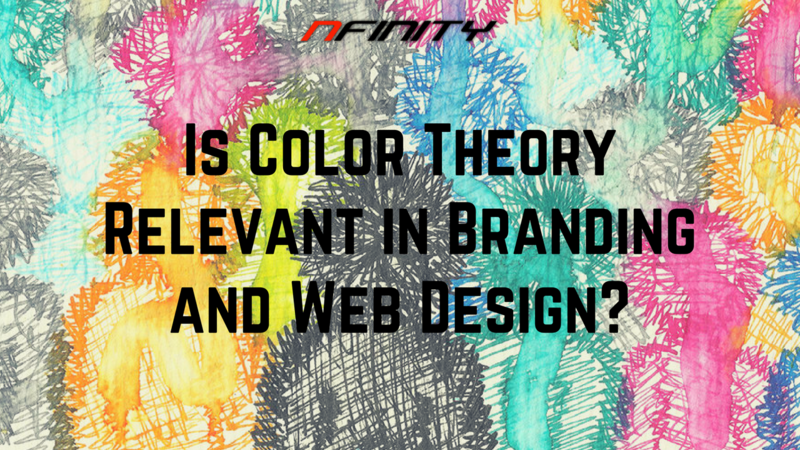 Is Color Theory Relevant in Branding and Web Design? The psychology of color and how it can persuade a person to like a brand is one of the most exciting and controversy-ridded aspects of marketing. Branding and color are believed to harbor a unique and symbiotic relationship that goes beyond merely marketing a product. Many think how a product looks has an impact on consumer habits. 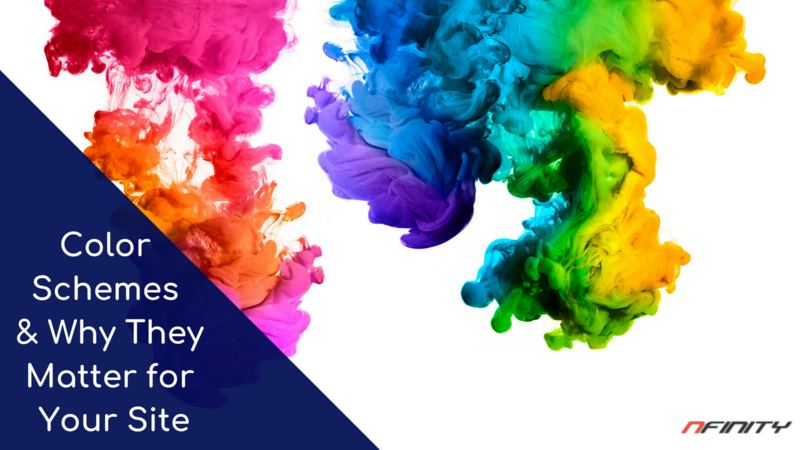 Color psychology is a profound topic to marketers today, notably because neuroscience says we, humans, are preset to appreciate specific color themes. It isn’t a surprise, therefore, when a topic on the same dominates today’s conversations with hunches and anecdotal evidence as the marketer’s point of persuasion. Studies show that color and branding and how the two are fused together can make it easy for consumers to recognize a company quickly. Of course, every branding attempt is to make the business stand-out and leave a reputation that lasts in the minds of the audience out there. That’s why whenever a color is selected to represent a given brand, lots of work, time and money is channeled into the venture. Every marketer dreams to have the best persuasion skills and since color relates to persuasion, they’ll readily want it. Tone communicates subtle messages that even the logo can’t, and you can test yourself through Nfinity Web Solutions’ choice of color and logo, for instance. Color can increase consumer’s appetite, soothe mood, reduce any anxiety and make them feel appreciated. Color theory, therefore, acts as a simple way of appealing to a consumer and influencing his/her choice. Essentially, color serves as a sort of manipulation that is easily and readily available, and the marketer will use without too much effort. Research even supports the same, as it shows that color theory can affect the behavior of a consumer, a factor that inherently affects choices and considerations of a client. Is it reasonable to utilize color as a technique of playing with a person’s experiences? Well, yes. But as much as it is useful, it isn’t by any means a universal factor and can’t be naturally used to elicit emotional responses. However, it often allows for a wider pattern to be discovered beneath the power in color perception. It isn’t a surprise, therefore, why as much as 90% of snap judgments made after analyzing products and companies is based on color only! On how consumers perceive a given color, a lot of things are taken into consideration, including their age, societal and socio-economic status, culture, job or occupation, location, family status among other factors. Where the color is used, apart from on the logo, matters a lot too. It can be the website’s central theme, on its Call-to-action or sometimes on the merchandise page. This is evident from how Fortune 500 companies use it or even startups like Nfinity Web Solutions – primarily a single color or two on their logos. They definitely know the value of strong brand identity and being unique from the masses. Many of them, over 50% of Fortune 500, choose blue. Choosing yours too, depends on, not the niche you are located, but your brand personality. Red is boldness, fire or romance, while green is a bit eco-friendly. What this means is, you must know what the color conveys out there. Remember, color is what your clients notice first! Experience has shown us that updating and adding new content to your website will consistently improve its performance and increase your ROI. So, you got a new website design in 2016. It looks great and is very slick. Compared to your competition, you look absolutely fantastic. The only problem is that while this is a good thing, for most businesses this results in your website never improving until it has to. At Nfinity Web Solutions, we recommend that you compare yourself to the market and industry leaders; not what your local competition is doing. They might spend a lot of time stagnating, but that does not mean that you need to make the same mistake! So, do yourself a favor and invest in regular website maintenance. Not sure why you should do so? 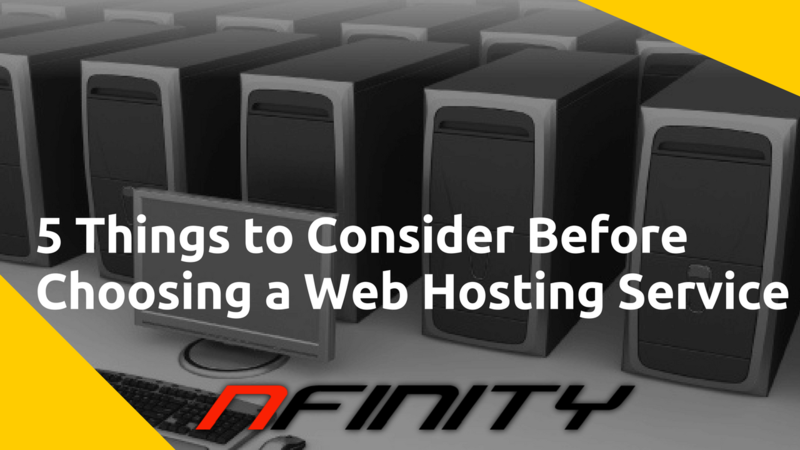 Here are five key reasons why so many choose Nfinity Web Solutions to help keep their website running at the capacity it should be. For one, it shows that you are always improving. When clients turn up to use your site and it has barely been updated since the last time they visited, it makes a rather poor impression. If your blog is not updated often and your products often retain the same, your sterile approach will feed into how people look at your business. Simply, if you are not willing to make the effort then it’s likely that your clients will wonder why they should bother, either! Website maintenance and updates makes it easier for people to want to come back. If they are used to getting access to little pearls of wisdom when they come to visit your site, they should feel that they are getting a very impressive response from your business. By giving them regularly improved blog content and new information to learn from, they feel like you are doing more than most to keep them informed. That trust is hard to get back once you lose it, so regular website maintenance is very important indeed. Also, a website that stagnates is one that falls down the search engine rankings. Competitors will appear on the scene and old ones will also improve, pushing you down. Website algorithms and online best practice changes over time, too, and a failure to keep up and adapt with that will just make your website and entire business feel dated and not very interesting to the reader. These are all serious problems, and can have a rather profound effect on how people read your business. The lower down you go, the less likely you are to ever actually get back to the top again! Your website needs updated, too, to avoid security threats. If your website stagnates, then it becomes an easier target for modern hackers and rogues who are looking to do some damage. You need regular updates to help make sure you are prepared to face any kind of attacks on your website. Lastly, your website needs to change to make sure it can keep pace with modern technology. Just because you installed a mobile site a few years ago does not mean that you can ignore having to revamp it. It’s like getting a new suit for work; a website update shows you are proud to serve your clients and makes them more proud to be associated with you. It’s a simple process, but one you should never ignore if you want to keep progressing! Today, social media campaigning is among your most powerful marketing tools around. More importantly, though, is Facebook marketing. Among the most useful forms of marketing in the world, it’s a hugely lucrative solution – if done right. Naturally, though, people see so much text and messages on Facebook that you sometimes need more than words to get spotted. This is why having a quality video campaign is so important. 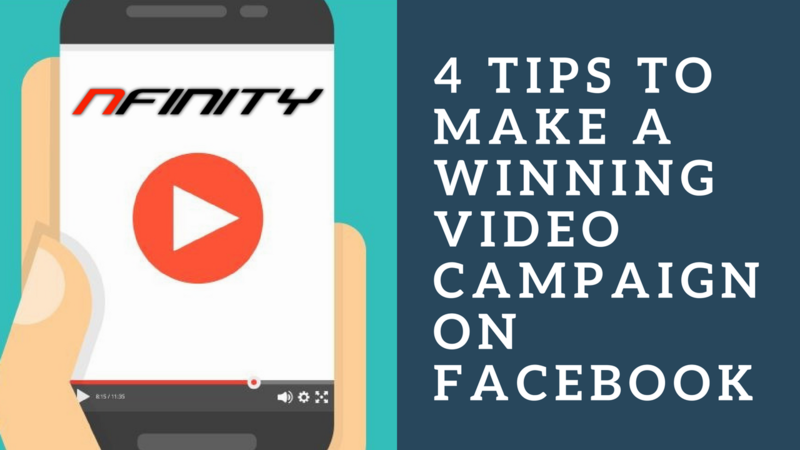 If you would like to make the right call on how to properly promote your business, then, here is a simple selection of tips that you can use to make a winning campaign on Facebook. Many people make the mistake of creating social media content forgetting that most people aren’t using 4K TVs to view the stuff. So, all of those tiny little images and Easter eggs within the video that you need a top quality TV to see? Most people miss that on their smartphones. Design your video for mobile and the big screen TV users can get a quality viewing experience without making those on lesser TVs and mobiles miss out on the ‘point’ of the video. When a topic begins to hit the news, you need to get into the cutting room and get making that new video. If you are not fast, you are last. Make sure you go to all the lengths that you possibly can to make sure that the content is relevant. Things move so fast in the online world that making a promo video with a nod and a wink to last week’s meme might fly over the head of your target audience. Keep that in mind; it could ruin the appeal of your video if’s even slightly out of date. A lot of business social media use is polished more than a cowboy’s boots. Don’t force yourself to edit and sanitize the video to the nth degree; take the time needed to make it look good, yes, but a bit of polish missing adds sincerity and authenticity to the image. By using native design tools, for example, you can remove that faux-big business feel and make your business feel a little more realistic. Make your marketing content closer to what your business stands for and represents; if that lacks polish? So be it. For any more help or information that you might need, you should visit Nfinity Web Solutions. We can help you to build a more cohesive and enjoyable online platform; one that is going to really make your social media use far more savvy and impressive in terms of effect and output. For anyone running a modern business today, it’s vital that you are serious about search engine results. At Nfinity Web Solutions¸ we help people to move up and then maintain their search engine ranking placements. 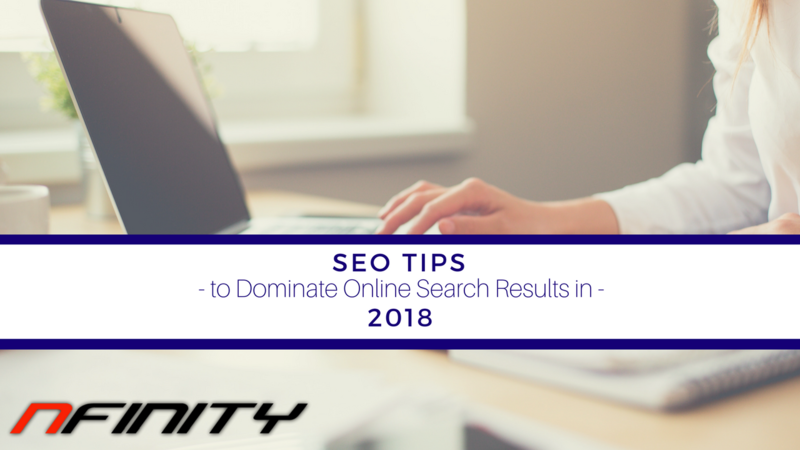 It takes a lot of work, but there are many little things that you can do to help boost your search engine rankings before you hire us to help you make the big changes required. 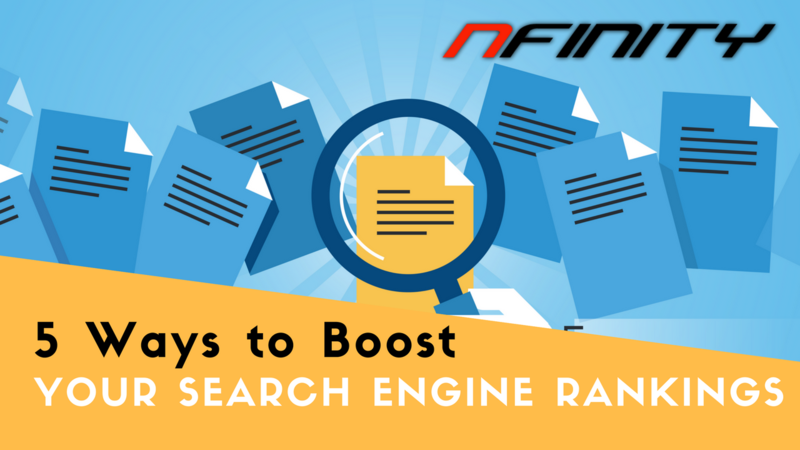 So, what can you do to help boost your search engine rankings? What solutions tend to do the most for your SERPs? The most obvious way to help boost your business is to make up new, high quality content worth reading. Pages of 2,000-2,500 words in length perform much better than smaller pages. Don’t feel like you need to be concise because not everyone will read the long-view content; the search engines want more detail, more customization and for you to be more unique. Don’t settle for small read content; the longer people spend on-site, the better it looks. Using h1, h2 and h3 tags on all of your pages makes a lot of sense. Not only does it help to improve aesthetic appeal by breaking up your content, it’s great for search engines to help make your content rank as it should. Format the text so that for every 300 words or so you have a header tag breaking the site up. This makes it easier for readers and for the search engine crawlers to read your site and make sense of the message you are putting across. They say a picture is worth 1,000 words. While that might not translate fully in SEO parlance, it does certainly help to have authentic, optimized images on-site. Make sure you add a tag, title and description on-site and ensure the name of the image is changed to match a keyword for that particular page. This can have a big difference on how your website ranks, and only takes you moments to actually put in place and benefit from. People want value today, but you cannot always provide the value that they need i-house. So, find high quality authority links to major publications and resources within your industry and link to them. Help to make sure that you have a relevant article that then allows the reader to learn more and expand their thought process about a particular topic by reading authority content from a big name resource. This makes it easier to be in-depth without just regurgitating the ideas on the original page. Just as important as adding new links is removing all links with 404 errors and the like. Check all of your inbound and outbound links and make sure they work; the more links that don’t work, the more you will be penalized by the search engines. Look at this and you can see a massive improvement in how your website manages itself and is read. As ever, the more time you spend looking at these website factors, the more likely it is that your website will succeed. Contact Nfinity Web Solutions for more advanced ideas to help improve and optimize your website in the long-term. In 2018, the importance of being able to rise above the competition is going to become starkly more apparent. There is a very real possibility that 2018 will see changes so pronounced and profound that the very fabric of your marketing strategy today will simply cease to work as it once did. In a bid to help you get around that problem, you need to have a bespoke SEO strategy. 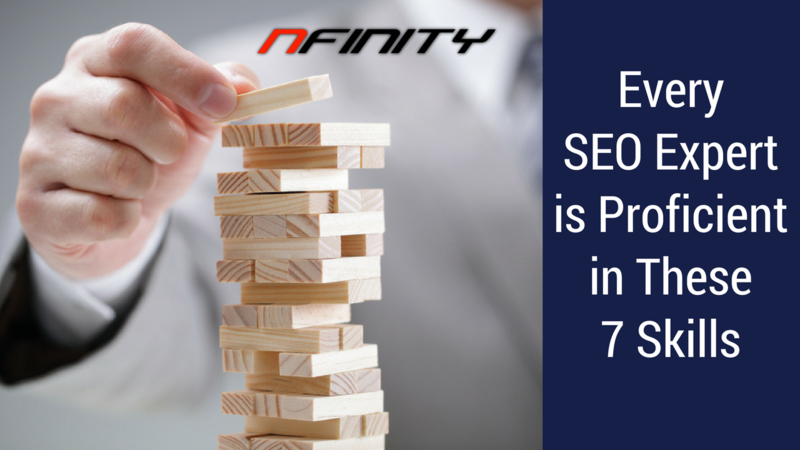 At Nfinity Web Solutions, we help people to make the calls on their SEO platforms to help it all become more personalized. Why, though, does this matter? Why does your strategy have to be so customized in the first place? Well, for one, it helps to define a clearer marketing message. At the moment, there is a very real possibility that your website merely exists to get leads. Now? A website is expected to not only be the introduction to finding a solution, but the location where said solution can actually be found. This is a major change and much harder to organize and prepare for. To help you with that, recommend that you look the strategy as a means of forming the perfect plan to make sure your website can be the provider of solutions, not just a generator of leads. At the same time, your website has to be more bespoke because standard SEO practice is now industry-wide. You cannot get by with the basics any longer; it simply means being armed with the same tools as your competition. In a bid to stop that problem from exasperating, we recommend that you take a closer look at forming a custom strategy to help outstrip the competition and move away from being in a position where your strategy is only as good as theirs. You need better if you want to be ahead of the competition; rest assured, they will be looking beyond rank and file SEO strategies, too. Not only that, but using tools like a custom SEO strategy allows you to box off your competition. At the moment, your competition is everyone who appears on the same page on Google as you. A custom strategy allows you to break free of that issue and instead make it easier to minimize your competition, instead making it easier to be seen as the ideal choice and selection in amongst a more select band of elect prospects. It also allows you to be caught out less when algorithmic changes arrive. These happen a lot with search engines and it can play a major role in why your website plummets down the rankings. Bespoke strategies are built with the idea of coping with algorithms, though, and this can mean that when changes do come into force that they offer nothing like the same problems and hostilities that a standard package would be. With Nfinity Web Solutions, then, you can make sure you get access to a definitive marketing solution that allows you to leave these problems behind. If you want to avoid being caught out or you want to better define your competition, you absolutely should look to work with a more customized strategy. 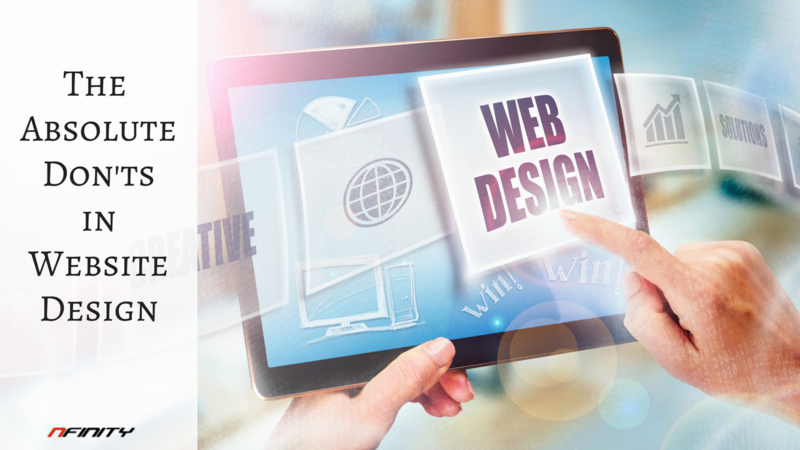 For any business owner, having a quality website that follows modern design trends is very important. Your website has to maintain some form of visual independence or it can be hard to put your platform together in the right way. In a bid to help you out with that, we recommend that you take a look at this simple and easy to follow guide to keeping your website current. 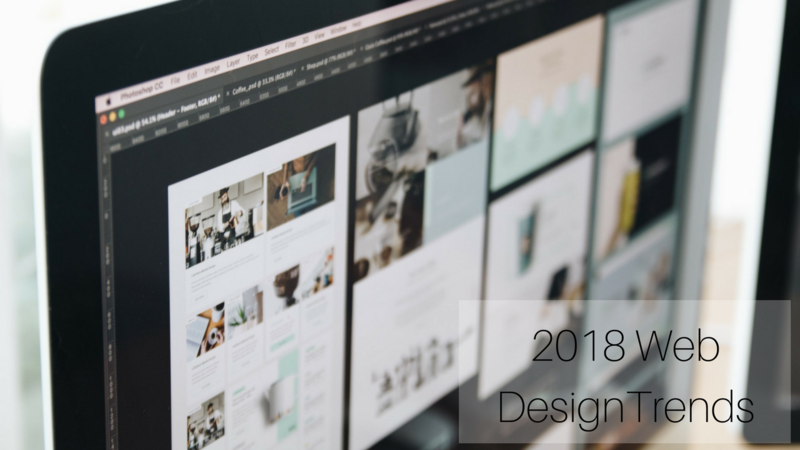 While working with Nfinity Web Solutions ensures you can stay modern and topical, these simple design trends should be an aim for your business in 2018. As websites scale back to create a more minimalist looking website, designers are being more open minded about the imagery they are using. Many are going for a bold website that’s minimal on website detail but high on using imagery to help sell the point. With large fonts, more vibrant color schemes and an online interface which is instantly easy to use, the aim is to keep using imagery to make high quality content come to life in a way that it simply did not in the past. People, when using websites and apps today, want more interaction. Interaction more than anything else keeps the user engaged, so there should be a clear push in 2018 to help make your online experiences a little more welcoming and user-friendly. Hard to do? Of course. From polls and quizzes to little games and lots of mini-events, you can make your site stand out in some style with a more interactive, engaging and open-minded style that is sure to make the right impression. Another key trend we have spotted is an increased use of animation within a website and app design. More illustration and animation will help to keep the people visiting your website engaged and thus can play a major role in helping to create a more optimistic and open-minded website. If your website is rather still at the moment, then adding a jolt of life via animation might be a good idea as 2018 rolls into view. 2017 was a year where a lot of people had a kind of ‘work in progress’ feel to their websites; 2018 is the year they should get round to finish that off. A more polished look on websites and web apps is becoming commonplace, and is something that you should absolutely look to make the most of as we move into 2018 and see a wholesale shift in the way that people look at website designs. The days of ‘in construction’ websites are dying out; we’re now entering an era of websites that look polished, clear and complete. All of the above will play a big role in deciding how your website is going to be looked at, used and primarily judged. With Nfinity Web Solutions, you can make a big difference to how your website looks while making sure you can utilize and make use of all of the above tends to really stay in vogue and fashionable in the eyes of your customers. The recent technological advancement has swept the memories of a lot of persons about the time when they used to buy things manually. In this age where the businesses are coming online, these individuals are so busy that they no longer visit the shops to buy whatever thing they need. For this reason, day-by-day, online shopping is increasing from e-commerce websites and there are quite a number of them on the internet space. There is a lot of competition in play and the ones with the most captivating content as well as an easy-to-navigate website are attracting more people. What this means is that you definitely have to maintain both a highly adaptable as well as responsive website for all. Not to worry, Nfinity Web solutions have your back. To stay ahead in the competitive world, your business has to discover what is the latest in the market while you take advantage of such. The latest research has it that e-commerce is otherwise called mobile shopping. Compared to all other shopping done in other ways in times past, mobile shopping has broken all shopping records, increasing the sales of every available e-commerce business to a large extent. Moreover, the research stats infer that there is a rapid increase in mobile shopping because customers prefer searching for the things they intend buying on their phones rather than with or on laptops. Therefore, you might want to put this factor into consideration as this is the trend of things lately. For every lover of mobile online shopping, you obviously have to pay through your phone thus, you want a payment without hitch via the available payment gateways. Therefore, a smooth payment gateway should be offered by the website owners to make every customer a repeat buyer. However, the creation of a mobile-friendly e-commerce is not the only way to attract the users. You should take care of your payment gateway feature of course. 3. Increase in efficient loading and payout. A majority of individuals will have mobile data concerns and since these service providers are becoming somewhat generous with their packages, the e-commerce website development company has to put this concern into consideration so a bulk of the data is not wasted in loading the website alone. In the future, hamburger menus are expected to continue trending. the hamburger menus are developed with the use of the bootstrap framework and this pattern is what designers are following globally. There will be slight changes in the hamburger menu, come 2018. Using bright colors is one design trend that cannot be overemphasized especially as you anticipate the most explosion of this on the e-commerce website. Basically, the intention is to capture the users’ attention via the demographics done. As a website owner, you have to keep in touch with the upcoming trends while you innovate your website accordingly. 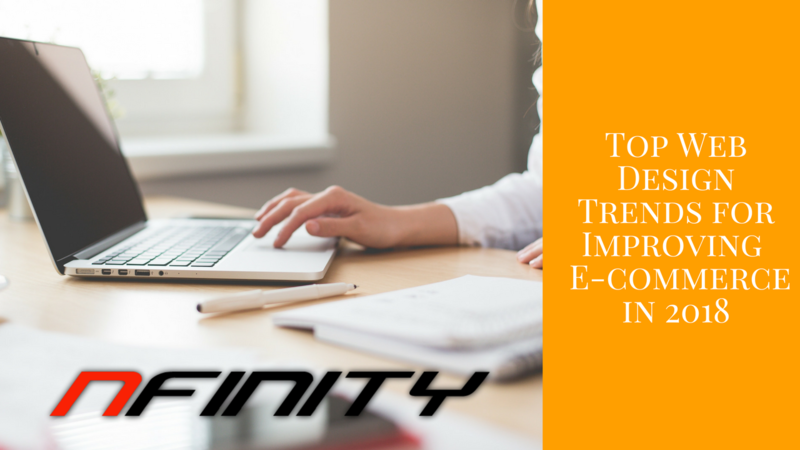 Nfinity is here to help you stay up-to-date and remain relevant in the industry with e-commerce development. Typography carries the largest share in website design. When people visit your website, they want to read the text to get some information about your company. Hence, little relevance cannot be attached to the matter of a website and its design or content, making your content organization a very important subject equally. Nfinity Web solutions can guide you through the process to engage as many consumers as possible via your website by making sure the exact intent of the business is conveyed. This is achievable through the typeface because typography is both a personal and relative matter that can as well be used to extend your brand. Therefore, you have to pick the most appropriate typeface for the industry your business represents as well as the one which gives your branding and images the necessary compliments. Through and across a website, typography is consistent, creaming your website with some aesthetics while it also enhances the attractiveness of the content all for the purpose of keeping a positive user experience. Basically, there are certain typefaces that are more appropriate for different industries, brands, and purposes. For instance, a law firm cannot use the same font as a Hair Care product manufacturer. A simple font is the most appropriate option even though at times, you might want to incorporate some decorative fonts to draw more interests. Before you decide on what typography style you will adopt, it is essential that you consider the messages you intend conveying first. When you have too many fonts on a website, you are confusing your visitors and prompting a lot of disorganization. This has the tendency to distract them after all. 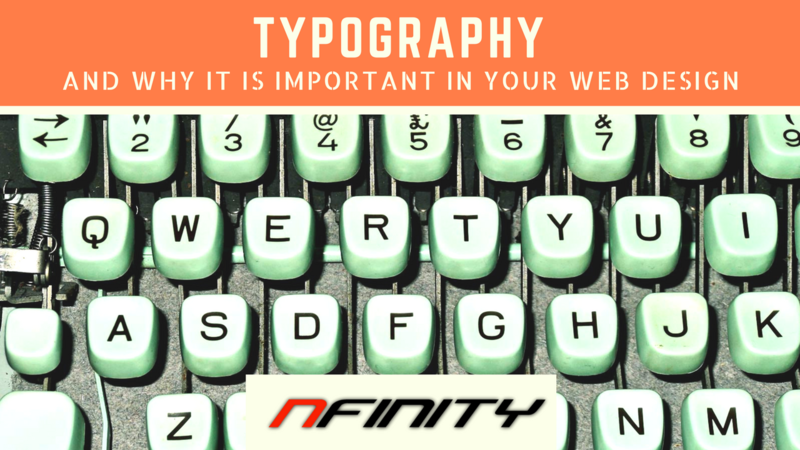 Nfinity Web Solutions would recommend the use of 2 to 4 typefaces in your website design and consistently, you can promote a great deal of professionalism with your business. Text alignment helps to compliment both the structure of your content as well as its flow. You can tell how the reader reads your webpage with a proper alignment as this serves as a guide to them. You can ensure the best user experience with the size of the words on your page. Because people are viewing at some inches away from their screens, you have to consider that factor in the process of designing your website. This means you should maintain large-enough and legible texts that are well spaced. There are many web safe fonts offered by Google and they can be downloaded for free. Meanwhile, you have to be aware that these fonts do not display the same way on all browsers. Hence, you might want to try as many browsers as possible before making a final decision. Today, web hosting can seem like a commodity in which you can make your choice based on the amount of disk space and bandwidth you desire for your business. Conversely, the idea of web hosting as a commodity is the wrong perception because web hosting incorporates some dynamism for delivering high quality and uninterrupted service. While you might want to choose a low-cost host, as a rational choice, it could cause more economic harm to your business than good. 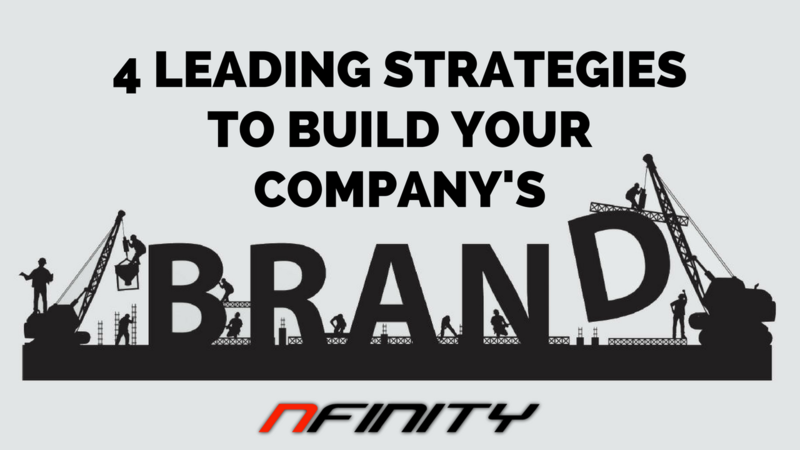 NFinity Web Solutions can help with making the right choice for your business and getting you on board. The speed at which your website loads is called the load speed and you can measure this from many sites. This factor is important particularly to offer the best user experience to your customers. One thing mobile users desire is fast websites and NFinity Web Solutions provides you an affordable way of speeding up your website. If you are receiving the required disk space and bandwidth for just a few bucks a month, you can be sure you have neighbors on that server and really, this can be a problem because these “noisy neighbors” are probably causing some detrimental impact to the performance of the server. In case the server hosting your business or website is detected sending spam or other malware, there are chances that the IP address gets blacklisted. You do not want that to happen as several things are hampered in the process, ranging from email delivery to the ranking of your search. There are several different software you can use to check up on your server’s IP reputation so you know if it gets blacklisted. You might start to notice some sluggish performance at peak times or other busy periods if you share a server and have an active e-commerce website. Hence, your RAM could just run out of juice because a shared hosting has the purpose of meeting the majority’s needs. For a small fee, you can bid these performance-related concerns goodbye. You might want to run versions of software that are not supported on a hosting service that shares with your business. For example, you may install Apache instead of LiteSpeed and that does not necessarily mean slower options are all disadvantaged. It is just that running some exotic tools may not be the best for you on a shared hosting environment or platform. Generally, web hosting solution as delivered by NFinity Web Solutions is not a commodity like fuel or electricity, hence you definitely have to make the right and informed choice with us for your web hosting service. You need no visionary to tell you that ecommerce is experiencing a massive explosion. The implication of this is that you must set up your store online even as a business startup. Without an accessible and inspiring online presence, ecommerce is non-existent. Hence, it is paramount that you make your business known to the ones who will most likely notice it. You can go about this by establishing the demographics of your target consumers. One thing we guarantee at NFinity Web Solutions is high-quality content which is both relevant and engaging, as we understand it is what makes customers repeat buyers. We, therefore, implore you to adopt the idea of creating content that reflects your brand, both in style and tone and be inclusive of your business’ mission, services it offers and policies. Visitors have expectations and they want them to be met. They are aware of the possibilities of delivering unique and individualized web experiences. You should therefore take advantage of every available technology, especially the ones that can let you make shopping selections based on your preferences. Lately, consumers are using more mobile devices than before, hence the need for a viable mobile ecommerce platform. Some of the solutions available include mobile sites, responsive sites, apps, maps, real-time notifications, etc. Let your consumers experience your brand across every channel of interaction and means of shopping. Ensure policies, services, products, and others are available online and offline. There are many ways you can subscribe to ecommerce. You can adopt the replenishment model, the discovery model or others. At NFinity Web Solutions, we decide which of these works best for you and in turn, implement them into your marketing strategies. If you want to grow your business, you should think about scalability. You can choose to depend on third-parties to accommodate growth and the costs incurred cannot be the same of course. The more your company grows, the more cost-effective your third-party logistics. With the internet, as a small business and startup, your consumers can be quickly and easily reached and continuously, manufacturers want to work directly with you knowing fully well that your brand has a tendency of bringing new products to the market you represent. Even though you can maintain a level of continuity across many sales channels, you can still present your products to the consumers via the internet exclusively. With this, you are able to build a brand with ecommerce as the main channel of distribution. Curating a proprietary selection means you can develop a strategy to administer a deep yet narrow bunch of exclusive products in a specific segment. 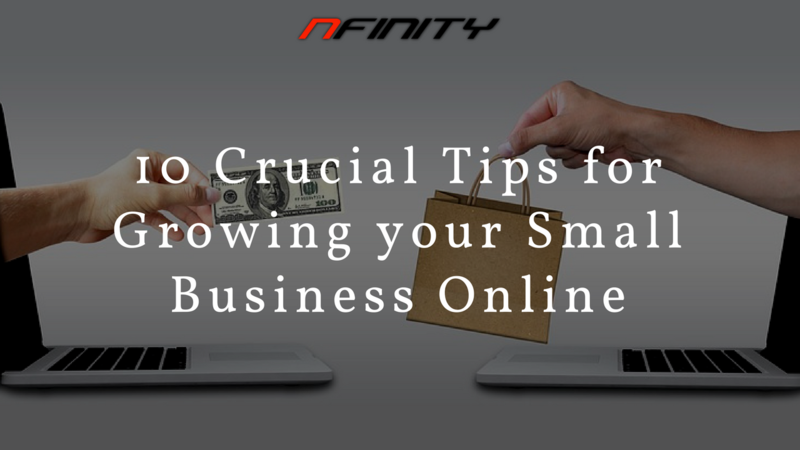 Consistent growth is one of the main targets of any business and with NFinity Web Solutions, through a combination of the steps above coupled with some diligent strategic planning and top-quality marketing campaigns, you will see an increase in conversions. Search Engine Optimization, SEO rules are changing but not so much because the fundamentals are still intact. The simple interpretation of this is that the system cannot be changed still, neither are you allowed to take shortcuts. To excel in the SEO game come 2018, you have to work. It is no gainsaying that understanding how search engine optimization works requires much effort and time. To top the chart of the game in 2018, much of your time and effort would be required to deliver real value. Basically, you must be able to relate to the rules that bind the subject. No doubts, paid ads are amazing and contribute positively to your business goals but one of the fastest ways to make money online and showcase your business to the world and to engage customers better is by using Facebook, Google or YouTube ads, as well as building a sales funnel. Yes, you can get these offers for free. That is what SEO is all about and can do for you in the years ahead- after which you can test-run things and later on use paid ads. There are certain rules you are expected to follow completely to crush the inherent competition and dominate the entire search engine results. What are these rules? Search Engine Optimization, SEO has three pillars that all businesses and individuals should understand. Tracing the way back to the evolution of Google’s search algorithms, PageRank was the platform (original algorithm) upon which search engine was built. Basically, it scoured the web from one link to the other and ultimately realized the entire internet by spreading around the virtual web. Better put, the more links found by a specific page, the more important its attribute to the specific page- meaning, more links, more relevance, and in turn, higher rank. However, things have not been the same ever simply because today it is more than just links. You cannot just dabble in the technical details without understanding these three pillars that keep SEO on course. These pillars are Authority, Content and Indexed Age. 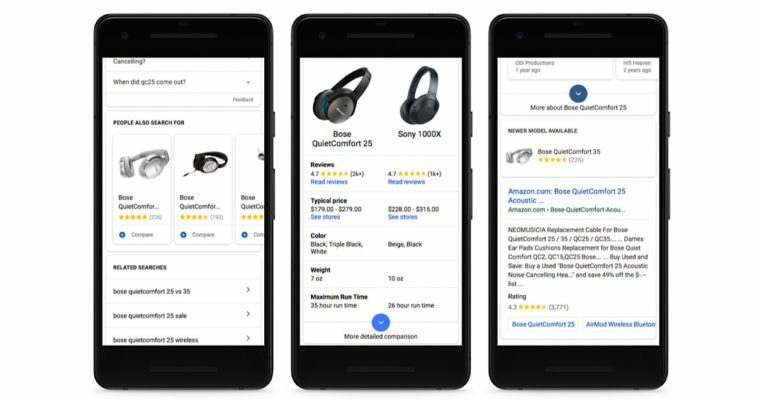 Google Shopping ads have been updated with a suite of new features that enhance the discovery, research, and comparison of products. With mobile shopping on the rise, so too is the amount of research being conducted on mobile devices before making a purchase. Here is a look at the enhancements to Google Shopping ads. Scrolling down past the “Quick View” information will allow you to discover visually similar and/or related products. An upgrade to the Knowledge Panel will display product photos, videos, reviews, descriptions, and further information when a specific product is being searched for. When searching for a broad category, rather than a specific product, Google will highlight buying guides to help narrow down your purchase. Google says seasonal searches containing “best” have more than doubled over the past two years. You can leave it to reviewers to determine the “best” product, or you can determine which is the best for your needs and budget by comparing products. Product prices, specs, and reviews can now be compared side-by-side in Google search. In addition, Google will alert you that a newer model is available if you’re searching for last year’s product. These new Google Shopping features are now live, but appear to only be available in US search results. 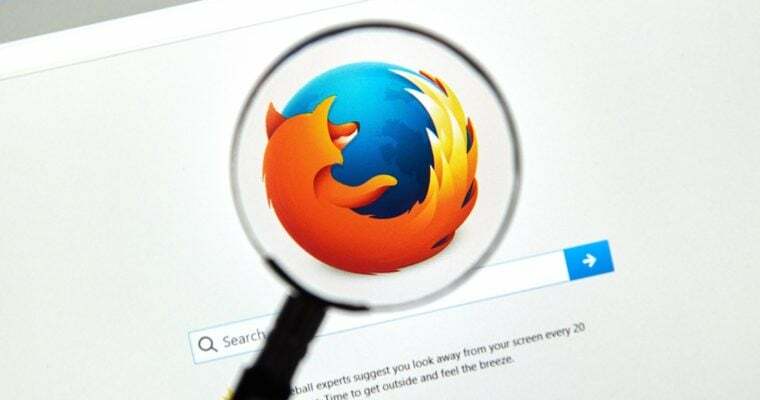 Firefox users can still manually change their default search engine back to Yahoo if they wish, or any of the browser’s 60 built-in search engines for that matter. Firefox offers the largest selection of built-in search engines compared to any other browser. Certain regions will feature a different default search engine, such as Yandex in Russia, Turkey, Belarus and Kazakhstan; and Baidu in China. 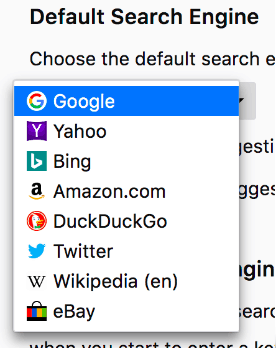 The rest of the world will have Google as the default search engine in Firefox. Firefox Quantum is available now for desktop operating systems.